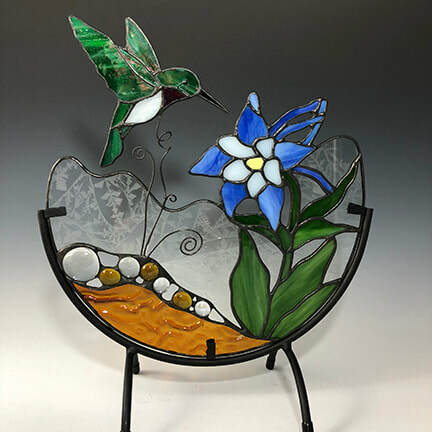 A Gallery Full of "Whimsy"
​We love when we get to showcase art by Manitou Art Center artists. This show features potters Madalyn Kae and Robin Scappaticci, sculptor and figure artist Nancy Morse, and printmaker Ramona Lapsley. 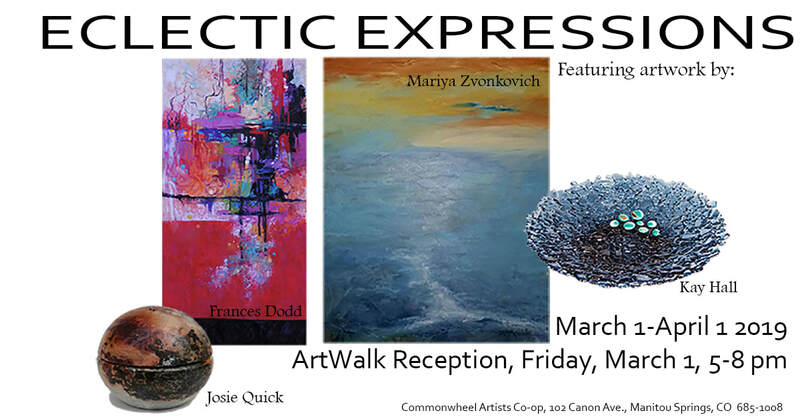 Together they will fill our gallery space with whimsical and colorful art to delight the eye and the imagination. 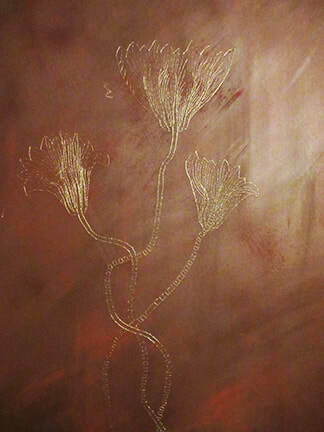 I am a Colorado artist who is interested in many mediums. I love the abstract expression of clay and am fascinated by rhythm, repetition, and the movement of textures. I find the marriage of function, expression, and beauty to be very rewarding. I am passionate about portraiture and figurative work and study them in my sculpture, painting, and drawing. I have been studying the figure and portrait for almost thirty years, attending figure drawing groups whenever possible. 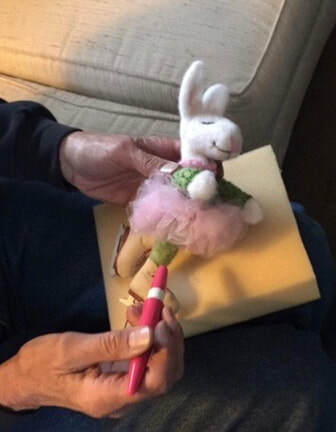 Sometimes (not as many as one would hope) getting a drawing or painting that can be, in itself, a finished product, but often I use sketches to then work into sculptures. I am excited to have the opportunity with this show to pull all forms of my art together in one venue. Recently, I have started spending more of my time on sculpture. 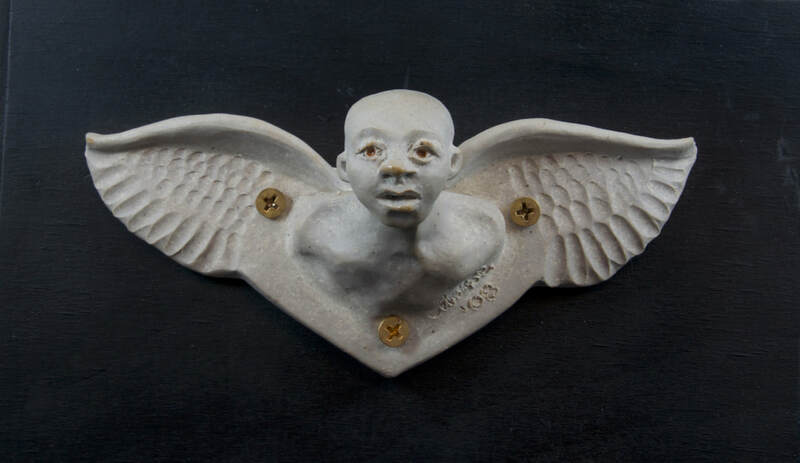 Many years ago, I started a series of “Gargoyle Coat-hooks” inspired by my travels in Europe. I have once again returned to the image and function of these. I find humanity (in all forms) and therefore the representation of it in art beautiful and fascinating. And hope the viewing public can see that as well. 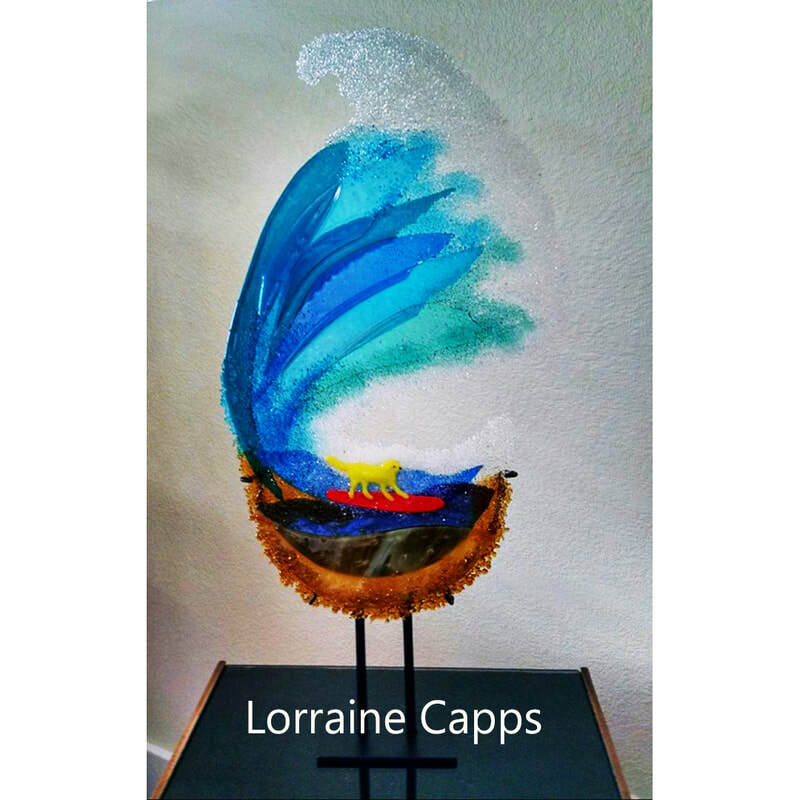 My work is expressive and indicative of the whimsy I see in the world around me. The creative process is like an expanded reality that is exciting, invigorating, and sometimes, in the most rewarding way, takes on a life of its own. For example, when a small unintended smudge or line in a drawing ends up being an important part of the finished piece. Visitors are welcome at my studio in the Manitou Art Center backdoor studio and quite often my work can be found in shows there. 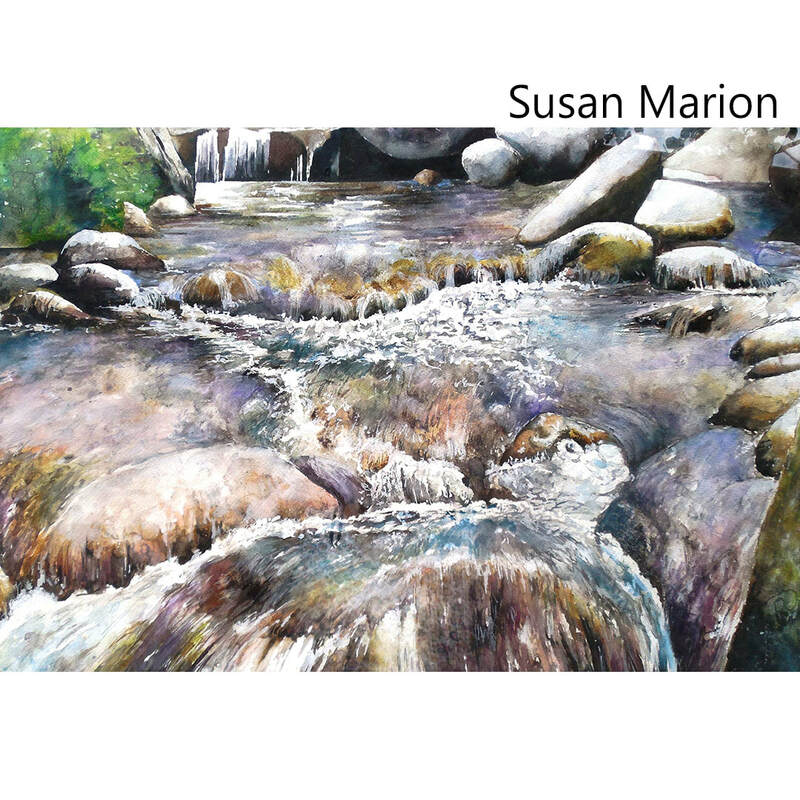 My work can also be seen online at nancymorseart.com and at the Boulder Street Gallery at 206 North Tejon Street, in downtown Colorado Springs. I have had a lot of fun creating my “Fabulous Flock” for the “Whimsy” show. Each porcelain bird is individually handmade and between 18 and 23 inches tall. It is challenging to work with ceramic porcelain at such a large scale, especially when it involves body attachments such as wings and beaks. After much trial and error these fabulous creatures arrived, each with a distinctive personality! I have been an artist since I was 8. The love of drawing and the encouragement of friends and family have motivated me to continue to draw, print, paint, and teach art. I have been printmaking for the last twenty years. I am fortunate to have access to the press and studio at the Manitou Art Center. Making art is putting a visual image reflecting thoughts, interests, and experiences on paper or in another media. Art is a way of bringing something important to light for others to see and enjoy. Sometimes words just can't convey what ideas I want to bring forth. 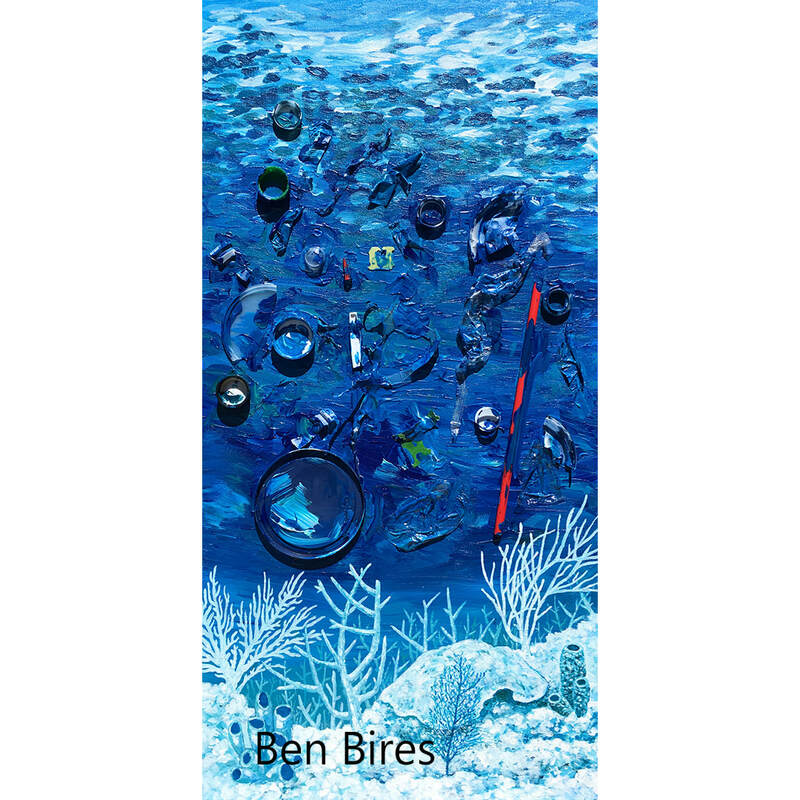 I have been working with images of fish and more recently birds. Colorado sport fish have been an interest for a really long time and more recently I have been depicting birds found in my neighborhood and at my feeders. There is a fun almost whimsical nature both in fish, and fishing, as well as bird communities. My linoleum prints start as sketches in my sketchbook from ideas or photos I've taken. I draw on the linoleum block with a sharpie and then carve out the white spaces. Using a brayer I apply a layer of black oil based ink on the block and then place paper on top. The image is transferred to the paper by pressing it thought the printing press. Later, water-based inks and colors are hand painted on the print. I like elements of design like the grid, square, pattern and contrast so I work those into my design. I have to like the image as a black and white print and then most likely add color to it. To the viewer, those same things are appealing. 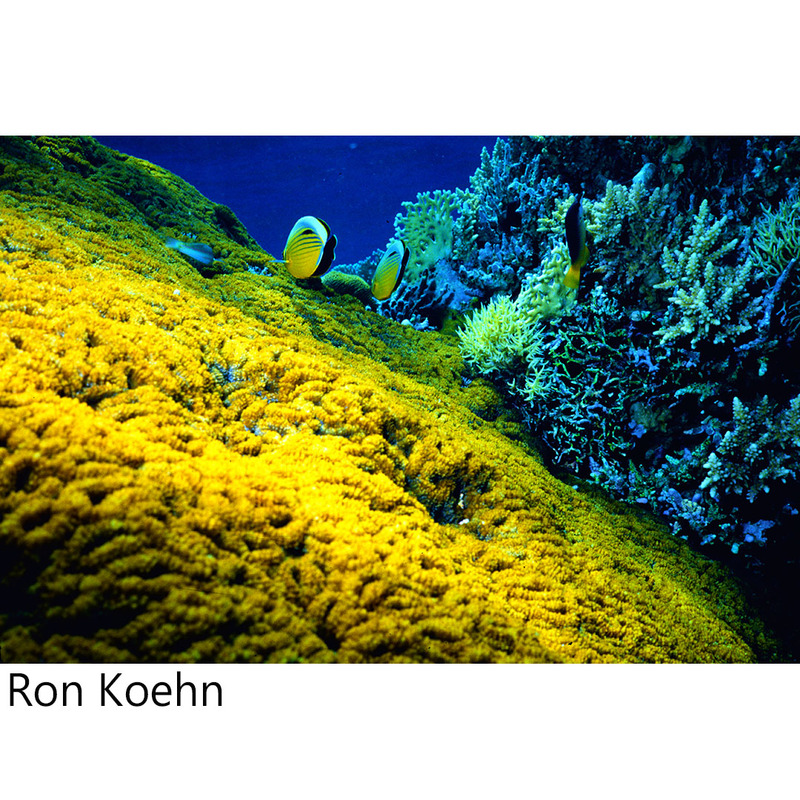 I also want people to see fish differently perhaps as well as birds. I want people to interact with the idea that you don't have to go far to experience nature. Fish can be spotted in the Ruxton creek across the street from the studio and birds are right outside my window. Both require observation and appreciation. I really like my newest print of the two woodpeckers. Although I have them perched on trees, it is really funny to watch them try to hang on to tube bird feeders. 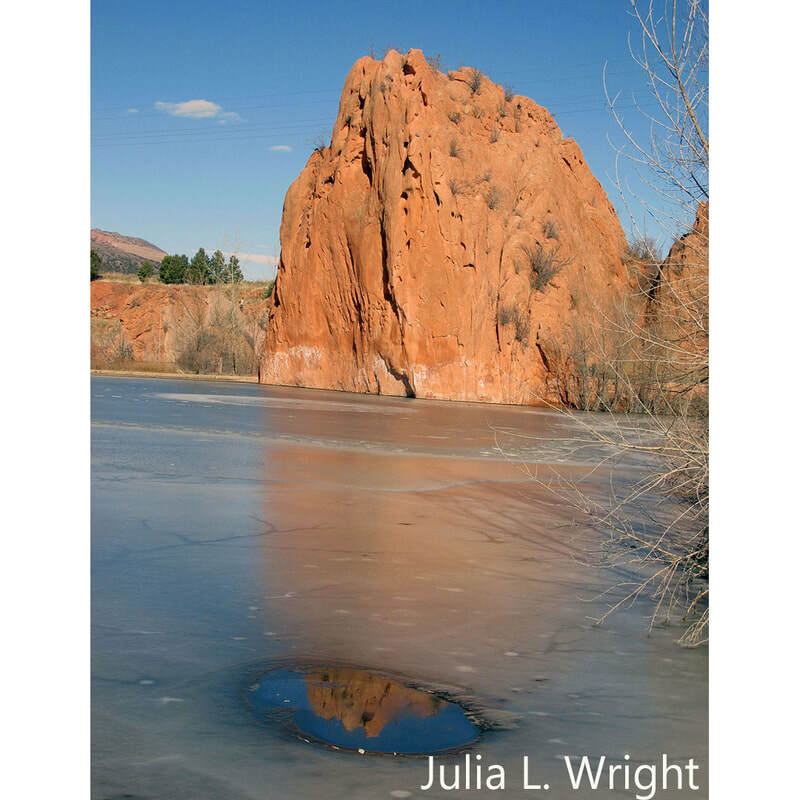 My work can be viewed at the Manitou Art Center Print studio as well as the gift gallery at the Colorado Springs Fine Art Center, the Sangre De Cristo Art Center, and the Lapis gallery in Denver on Tennyson. I grew up in the Hudson Valley in New York State. I took my first ceramics class in high school and fell in love with clay. I continued taking classes in college and ended up with a major and the idea of being a production potter, which did not work. After 25 years, I fell back in love after taking a summer class. I make pots for the joy of it. I love everything about it—working with the clay to form the piece, deciding what laces to use, thinking about and adding color, firing, and opening the kiln hoping for a successful outcome—even glazing has become enjoyable. Making art is about joy. It has been many years since I have thought that I could make a living at it. It takes way too long for me to make a finished piece. It is something that I do for myself. I love going to the studio and working. It is time that is completely mine. I love it when people appreciate what I make. I have used lace for about 10 years in in my work to create patterns and texture, and it makes a way to add color that works for me. Two years ago, I made a few flowers, and I had thought I would like to make more but never took the time. This show called “Whimsy” gave me the opportunity. 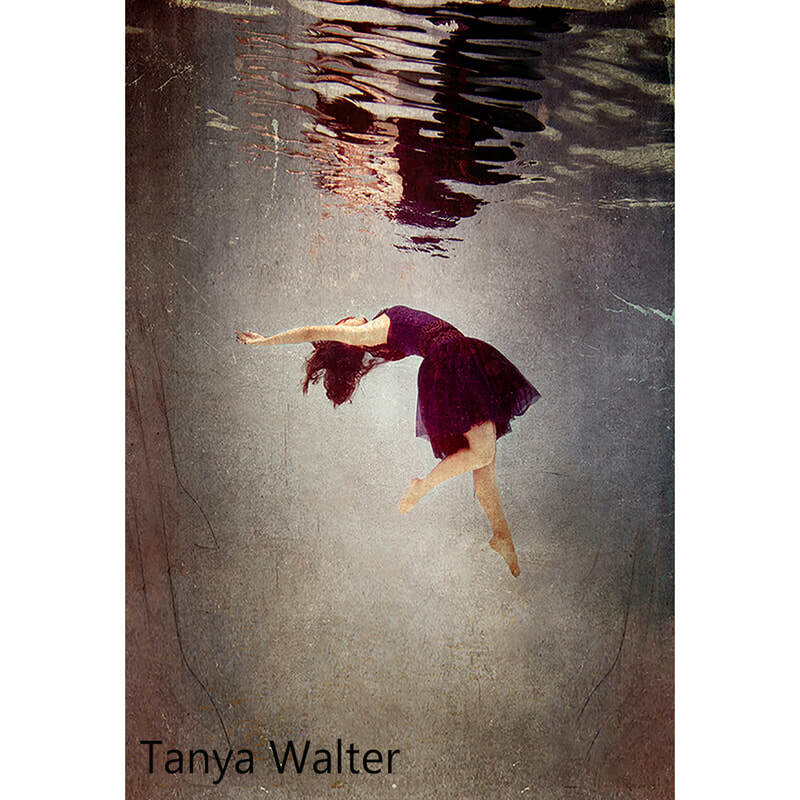 Water Flower was the first piece that I made for this show, where, for me, form and color came together. Tell us about why/how you got into art. Walk us through the your creative process. What emotions/reactions/thoughts do you want your work to bring? What is your favorite piece for sale at this event? ​I’ve been painting all my adult life and as a child I loved to draw, much to the consternation of teachers who found it hard to get me to concentrate on lessons. From a coal mining town in Pennsylvania my parents moved us to Manhattan, New York City when I was sixteen. 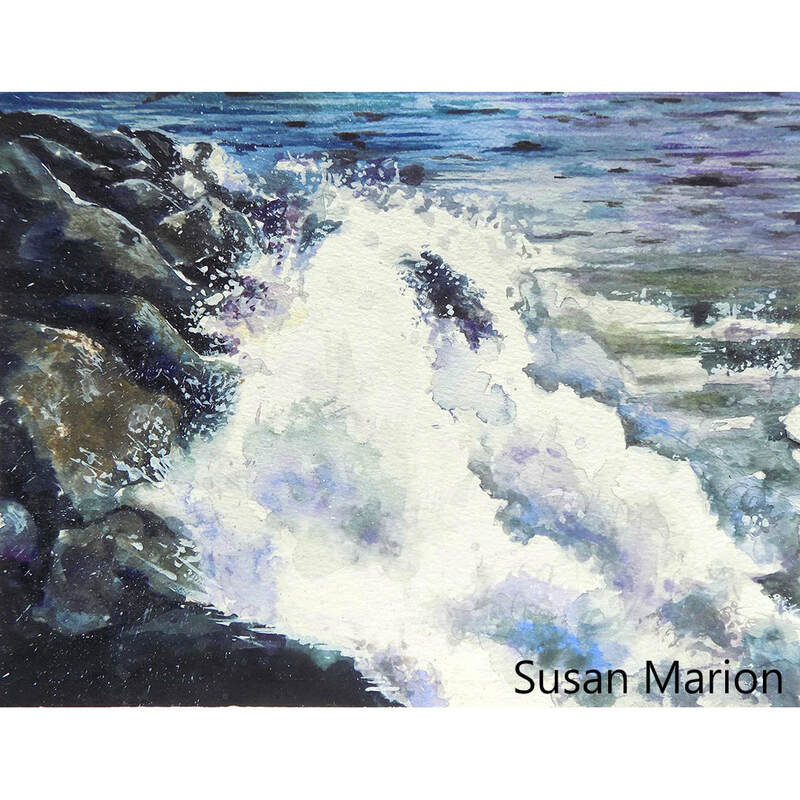 I attended the Art Students’ League in New York for four years and my first professional art exhibit took place at the prestigious Salmagundi Club where I was one of the first women artists elected to membership. After moving to Colorado in 1983 I continued to study with artists whose work I admired while having representation in galleries in Santa Fe, Taos and Colorado. My work began to earn awards at national exhibits, and I was inducted into the Master Circle in the International Association of Pastel Societies. 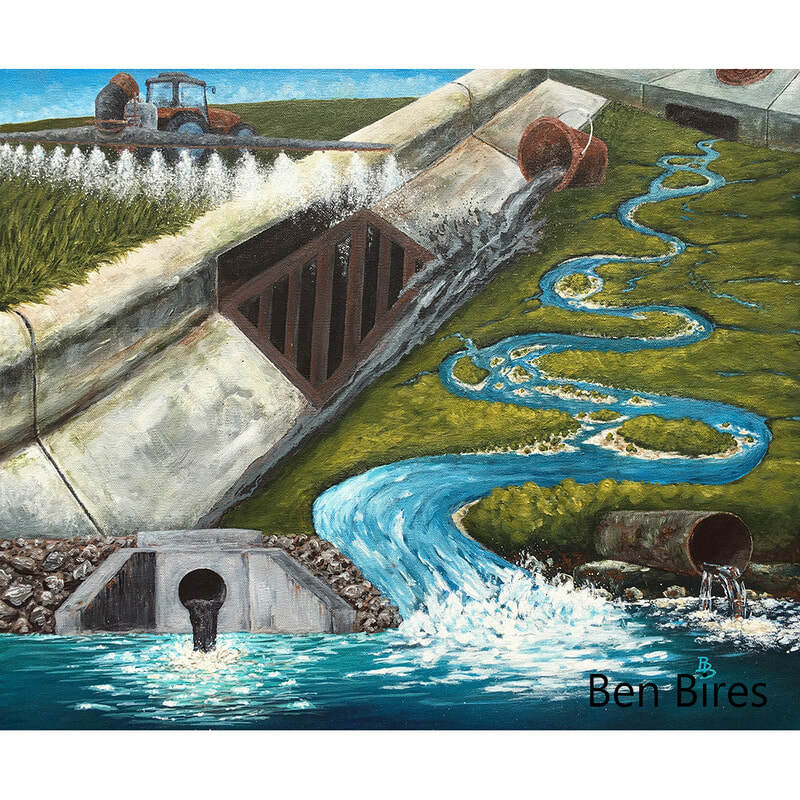 My work, whether in oils or pastels is my pathway to exploration and expression of the environment as I experience it. It has been my passion for most of my life and continues to be so. This exhibit in oils includes some of my tree series paintings which has preoccupied me for some years as well as abstractions which are more recent works. 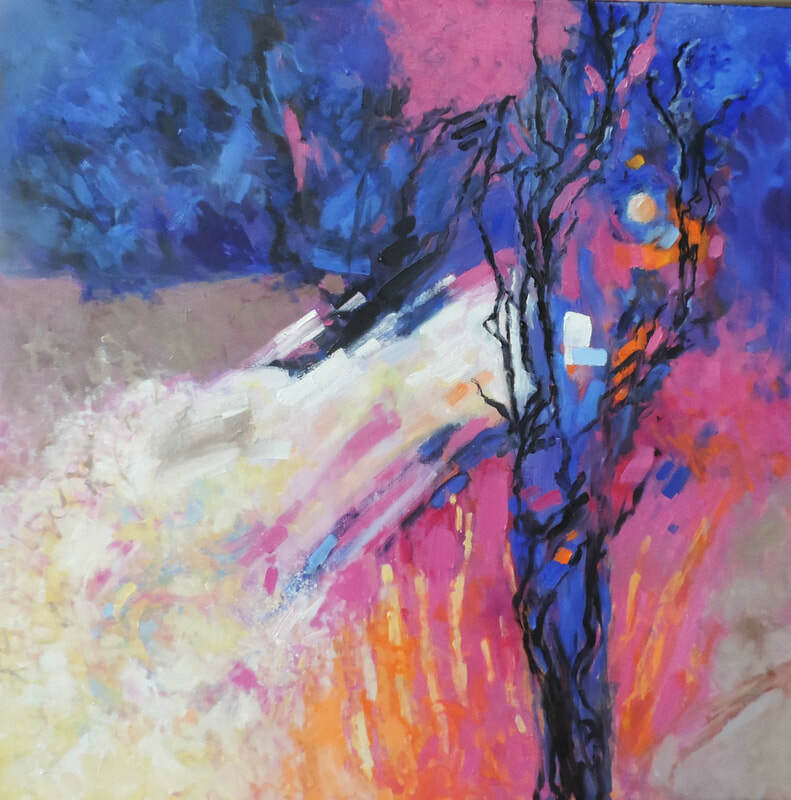 Although the tree series may be considered referential, I feel they are close to abstractions in that I take great liberties with nature in composition, color and visual interpretation. Expression through vibrant color combinations intrigues me and is present in all my paintings, no matter the genre. 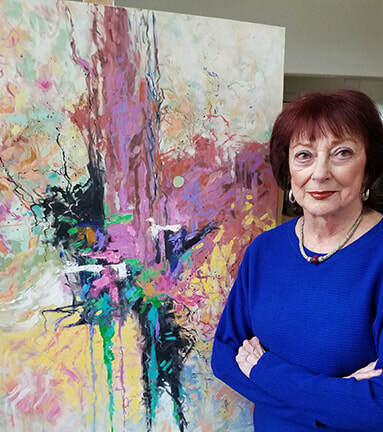 My hope is to engage the viewer, if just for a moment, and communicate the sense of excitement and connectivity I felt in its creation. 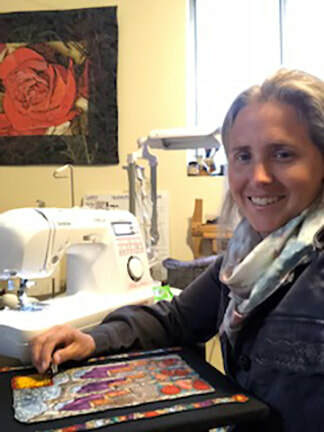 ​While working as a health care professional for many years, I have had many affairs with different arts and crafts. I was always on the lookout for the one that would captivate and challenge me—my one true love that would balance out my very left-brained, non-creative profession. 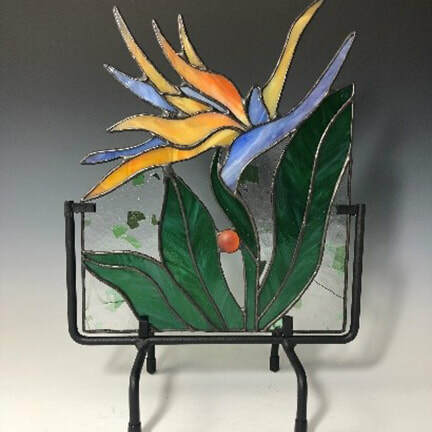 My current body of work includes small glass mosaic pieces (light switch covers) and fused glass work utilizing recycled glass (tempered glass shelving and automobile glass). I love the green aspect of using “glass with a past”. They take on a life and Renaissance of their own. Each piece is individually designed in my Colorado studio with special attention to color, flow, and functionality. 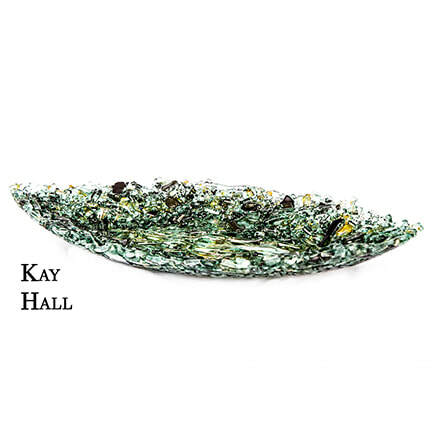 Whether I’m working on a mosaic piece, or trusting the kiln gods with a fused glass creation, I am learning to appreciate the magic and alchemy that transform a simple material into a glorious piece of art. I enjoyed being part of the Recycled Art show that Commonwheel had a year ago. So, when the opportunity arose to get into another show I jumped at it. This is a beautiful gallery, all the artists I met were welcoming and professional. 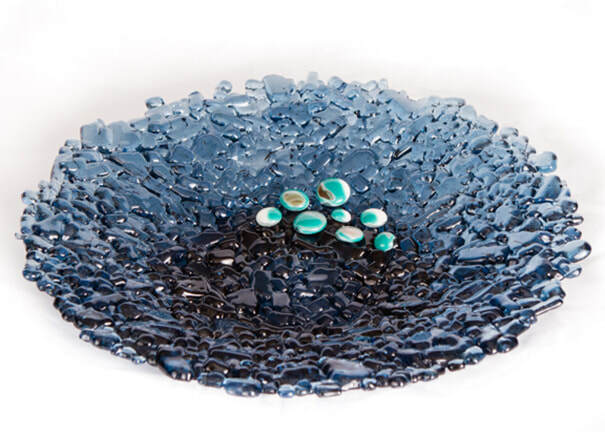 My favorite work right now is the fused glass. All the objects are made from recycled glass, some of which I pull from dumpsters while on walks around my neighborhood, some of which magically appears on my front porch as my neighbors all know what I do. The green pieces are from the rear window of a car. 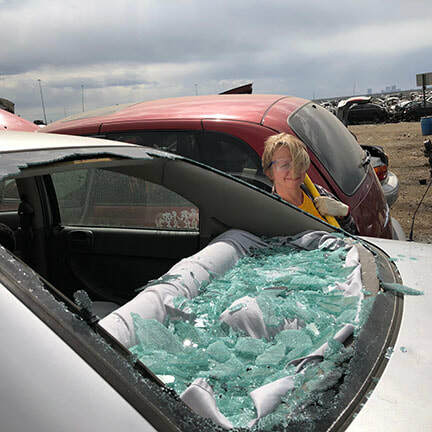 I use so much of that glass that I now go to a junk yard in Denver with a sledge hammer when I need to replenish my stock. Other types of glass I use are shower doors and glass shelving. All of this glass would end up in a landfill if I hadn't "rescued" it. We, as a society, simply throw too much stuff away. I hope viewers of my work will be surprised and delighted to see what can be made from glass that is typically thought of as trash. 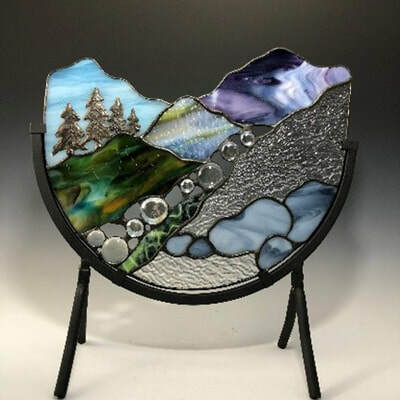 I am a member of Shadow Mountain Gallery (also an artist-owned gallery) in Evergreen, Colorado. ​I have always been interested in art, in elementary school I was the kid who was drawing instead of doing my work. I flirted with becoming a commercial artist or graphic designer, but being a musician won. My initial medium was drawing, either pencil or pen and ink, but once I got the opportunity to use a potters’ wheel I was instantly in love with clay. I have been a hobby potter for nearly thirty years, it’s an obsession. Creativity is my drug of choice, whether it’s making music or making art. Art is my solace, my therapy, my expression of living in the moment. I have been exploring clay saggar firing for the past couple of years. I’m intrigued by the element of chance of atmospheric firings. There is no possibility of duplication, there’s no way to plan how the gasses in the kiln will color the clay. I love that spontaneity and randomness. It’s an artistic expression of Carpe Diem. Every time I open the kiln it’s like Christmas. I have been intrigued by bottles for many years and have been trying to perfect the form. 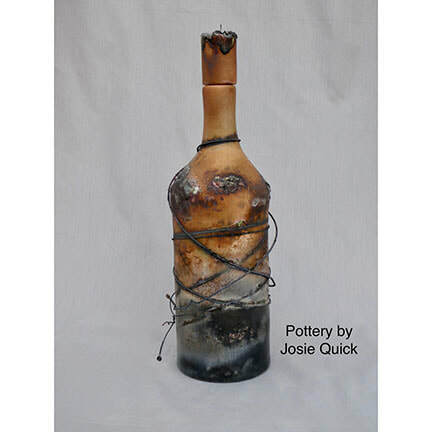 I was inspired many years ago by a poster in our community studio of wood fired bottles. When I discovered the saggar firing technique it was a perfect combination. The "saggar" is pot made of clay that the piece to be fired sits inside of. I wrap old guitar strings around the piece to create dark lines. Then inside that saggar I put various combustible materials that will create chemical gasses that will color the piece. Some of the materials I will put in the saggar are wood chips, horse manure, plant food, coffee grounds, salt, all sorts of things. A big part of the fun is playing mad scientist, throwing various things in the saggar to see what they do. One happy accident was when the guitar string melted onto the piece, I loved the look and now I try to make that happen. The saggar is then put into the kiln and fired to about 1700 degrees. 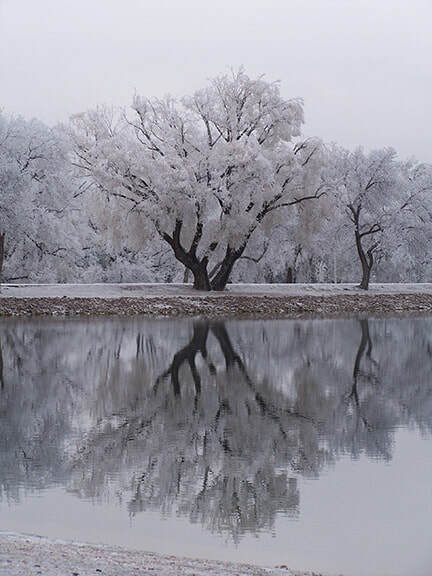 I want people to see beauty, to see spontaneity. To enjoy the moment that was captured by the clay when they look at my work. My favorite piece for this show is this bottle (see below). I love it. The form is beautiful, the colors have depth and variety. This is a perfect coming together of chance and skill. I am also on Instagram as fiddlequick. I am a member of the Aurora Potters’ Guild, my work can be found at their bi annual sale. ​I have always been an artist, but when I started college, I did not think it a viable major; yet took a painting or drawing course every semester. I had switched majors three times, until as a sophomore my art professor asked what in the world I was doing – and that for heavens sake I should be majoring in art, and not only that, they needed me! It’s pretty seductive to feel needed, and that’s where I was happiest, so I switched majors one last time. Making art is not only a way of expressing my world–but also being part of the creative force. One of my colleagues talks about being a Maker, which is profound, yet so basic! The original concept for this exhibit focused on a variety of media and abstraction, hence, “Eclectic Expressions.” Despite advice from professionals and gallerists to stay with a single theme, there was always a new path to explore and more than one tempting choice to make. I often consider Robert Frost’s poem “The Road Not Taken.” And I wonder. . . Yet, life is exciting, and thus should be one’s work. It’s not just a journey – but real trip! I start with my sketchbook, in plein air, and/or photos, or sometimes with memories so distant they can only be rendered as abstraction, i.e., Sand and Sea. At times research is needed: i.e., dragonflies don’t pose. I want the person looking at my work to find Connection. The viewer brings his/her own story to a work of art. My favorite piece of work for this show is RED. 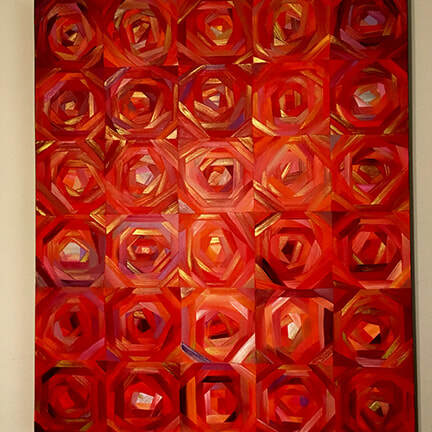 Aside from the universal emotion of the color red, and the universal symbolism of the spiral, it was just plain fun to focus on mixing so many varieties of a single color - which is essentially the only thing I needed to think about during the painting process. 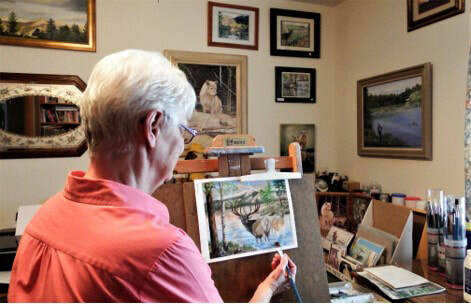 I interviewed Frank and Ginny Maiolo, our March Artists of the Month, in their home studio. Frank and Ginny named their studio Monument Moon because they live in Monument, Colorado and Ginny has been enamored by the moon all her life. Frank and Jenny are jewelers. They design and create jewelry from silver or copper with gemstones and precious semi-precious stones. They make rings, earrings, bracelets, pendants, sometimes dog tags. Most of their work is done with hot connections using solder and flux. They use an acetylene air torch for silver soldering. 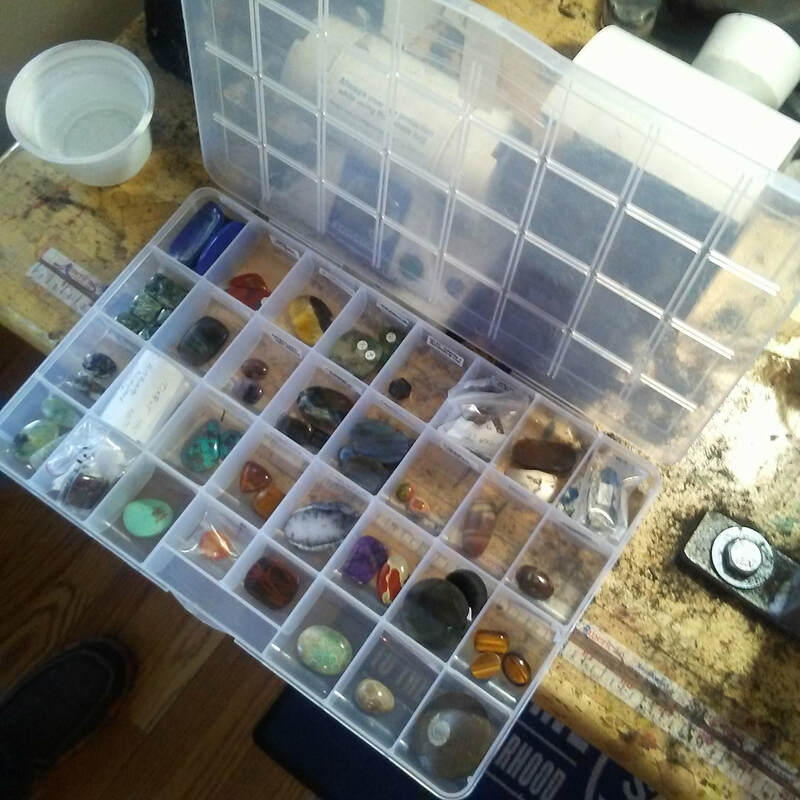 They have been rock hounds their entire lives and have a large collection of stones in their studio. Ginny and Frank retired from corporate America seven years ago and decided to have fun with the rest of their lives. They had both been managers for software development groups at FedEx. One of the women worked for Ginny made jewelry and Ginny asked if this woman would give her a class. She came home from the class and left all of her class instructions on the table and went shopping. When she came back home Frank had already made two pair of earrings. I asked the question I typically ask silversmiths: how many hammers do you have? They start counting and come up with 17. They’d have more but the hammers they like are really expensive. Then I point out a large hammer under the table, giving a final count of 18. They use a rolling mill as much as hammers for texture and have another tool with a texture attachment. ​I asked Frank how he came to start his line of Camino jewelry. In 2015 they decided to would do the Camino de Santiago pilgrimage in Spain, a 500-mile-walk through Spain on the Santiago de Compostela. After they got home, they realized most of the commemorative jewelry they had seen on the trip was made in China. So, Frank came up with a couple designs for pendants, rings, earrings, and bracelets and has been selling those now for a couple of years through our Monument Moon site, Etsy, and Amazon handmade. The pieces can also be found in Camino Marketplace on Facebook. But Commonwheel has been a freeing experience for them both. They had rigid corporate standards in software development, which is something that really turns software developers off because they want to have their own thing. Now they can do anything they want and can experiment, and play, and don't have to worry about it. For the newly retired or those who want to expand their creative life the recommend taking classes anywhere you can find them. Whatever you learn will often carry over into other areas. Looking at the different types of art that Commonwheel carries and that they do you will find they all draw on the same art concepts: the rule of threes, asymmetry, and so on. Everyone has creativity whether it's in music, writing, art, even thinking—which basically starts at all. Ginny and Frank have two completely different design methods. Ginny has a basket of ideas in her space. When there were wildfires near their home a few years ago, this basket is one of the things their daughter took to keep safe. The basket contains her ideas, drawings, names, etc. “I keep it by me at night when Frank's watching TV and jot down ideas. I have a basketful of paper and pencils and I'm designing,” Ginny says. Frank says he designs at the bench. He doesn't do any drawings. He just sits down with his raw materials and it grows. Usually he's picked a stone out of their collection first and does a lot of designing in his head. In addition to Commonwheel Artists Co-op and our Labor Day Festival the Maiolo’s sell at Front Range Open Studios. This will be their seventh year. There are currently 16 artists in Monument that are part of the weekend event in September. Art by other co-op members in Monument Moon Studio. Interview by Juanita Canzoneri. 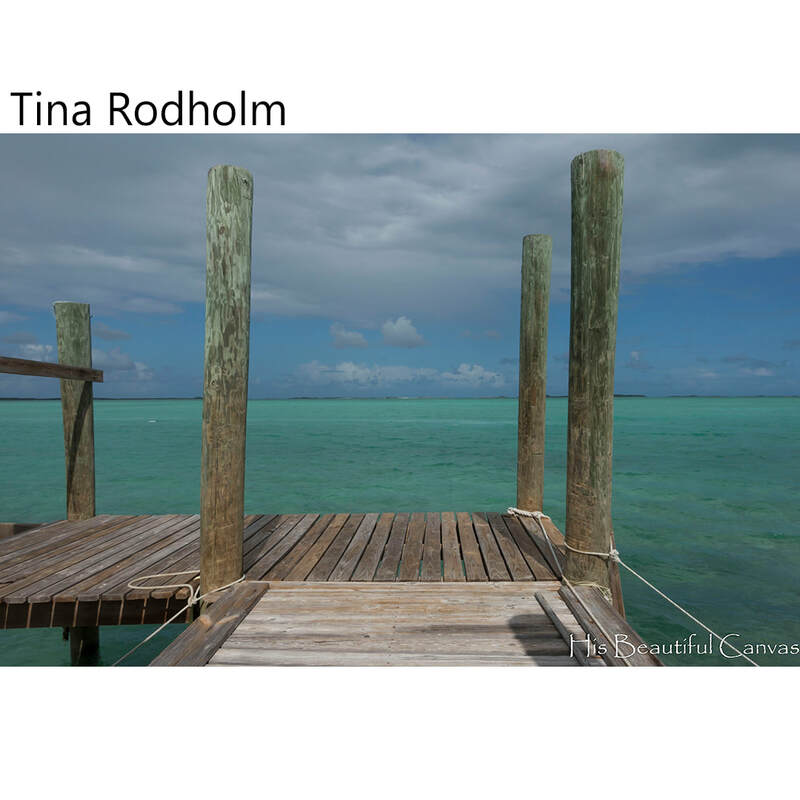 Photographs by Juanita Canzoneri and Teri Rowan. 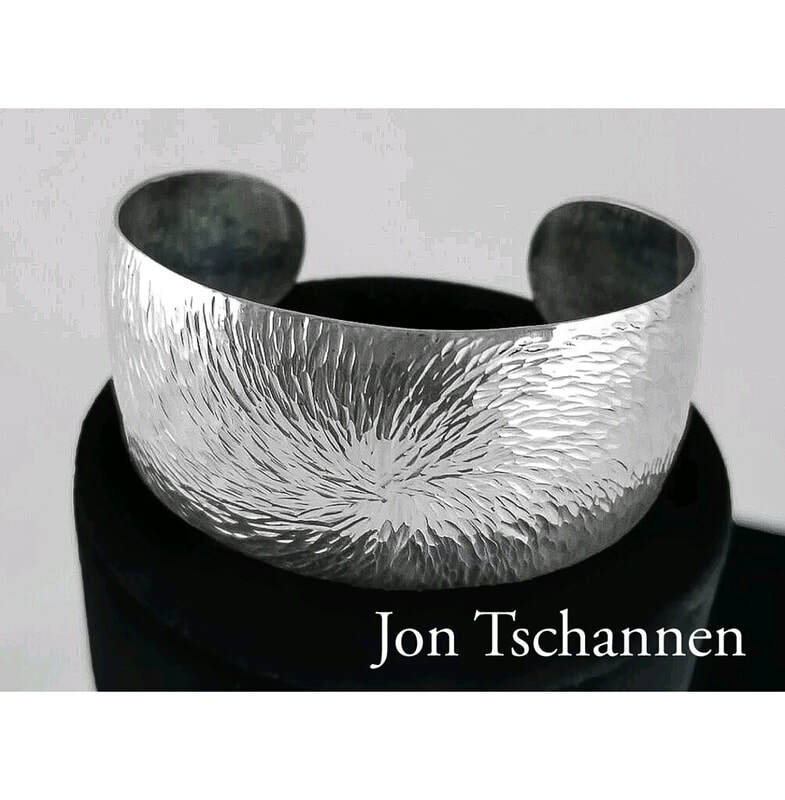 Jon joined Commonwheel as a jeweler in 2018 and has made himself indispensable to our Jury/Display committee. I went to his home/studio to interview him for this article. He is our Artist of the Month for February 2019. All his work is on sale at 10% off through the month. And how did you get into that? I've often admired I've long admired Southwestern jewelry and wanted to learn some of those basic techniques. But I didn't want to try and duplicate the designs that the Indians used, I wanted to do my own designs. So I took a couple classes of some of the basic techniques. That was about 25 years ago and I've been kind of self-taught since then. What did you do before you took up silversmithing? Lots—small animal veterinarian for 20 years, then my wife and I owned a bird feeding store which gradually transitioned into a bookstore. Yeah, I’m a birder. We sold that and the next thing was a B&B with some rental cabins here in Manitou. I most recently we had the kitchen store then the economy changed, and we retired from that. Now I have more time to spend on my silversmithing. Where do you get your silver? Most of it I get from Santa Fe jewelry supply. I get sheets and wire. They come in an incredible variety. Speaking of working with a commodity, right now it's not too bad but the price has been pretty high in the past. While I've been working with it can remember $5 an ounce and as high as $40 an ounce. Right now it's at $15, so not bad. What part of the country did you grow up in? I was born in DC but grew up in Colorado in Wheat Ridge. Went to school in Boulder for a few years got a degree in Zoology, then 4 years in Fort Collins for veterinary medicine. Now I'm in a career that I never have to retire from and enjoy a lot. 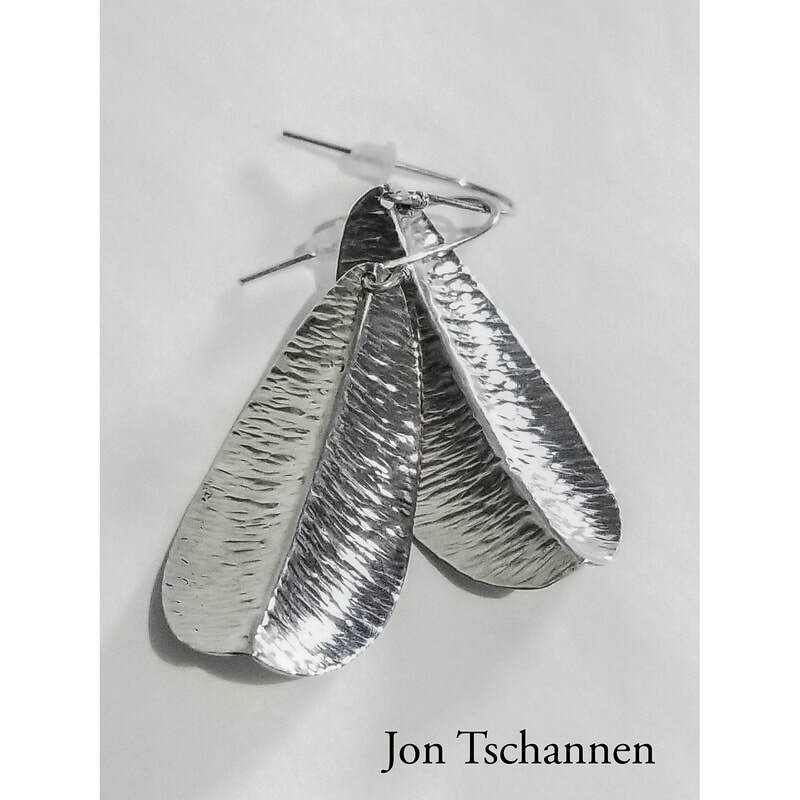 So when you started silversmithing did you take classes from somebody locally? Yeah Suzanne Lindquist was giving a 3-day class for kids at the Business of Art Center (now the Manitou Art Center). I called them up and asked if they would take an adult in that class and they said, I guess. Do you have anybody signed up yet? They said, no. What's the minimum number of people you need? 3. So I recruited a neighbor and somebody else to take it. We started by working on overlay, which is a technique that I still use and some basic forming. And then the next year she was doing a class at the Pikes Peak Community College and I took a semester there, and then another one again the next year and learned more techniques. She was an instructor that really emphasized learning design as opposed to just techniques, so we got along really well. I learned a lot from her. After that it's just looking at jewelry, and there's a lot to look at. 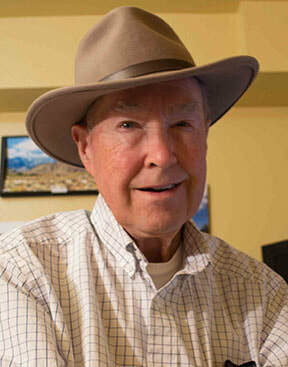 Jerry Scavezze,a gallery owner in Salida, he just sold his store. I was talking to him when he closed, and he said there's so many techniques out there you can't learn them all. You have to pick one and just go with it. I said yeah, my techniques are hammering and sawing, very basic stuff. Kind of goes along with the really simple designs I do. How many hammers do you have? About a dozen, I suppose. Maybe it's more than that. some of them I inherited from my grandfather and father. One was grandfather was a blacksmith and the other the mechanic and I was the only boy in the family, so I've got a garage full of tools that I've inherited. I modified some of these for forming or texturing or rounding. It sounds like you've got metal in your history with your grandfather being a blacksmith. And my dad was a mechanical engineer. he worked on cars a lot was a handy guy that did a lot of things. So what types of silver work do you do? I like texturing. You have to be in the zone to do it. You start making marks and you have to just start and be consistent. Ideally you hit every spot once and make it consistent because of the reflectivity of silver because of the reflectivity of silver reflective substance where is when it's all dimpled and shiny like that it just blames and sparkles. I really like copper as well, but I have problems with the perceived value of copper. You can spend two hours on a copper piece, and the same on a silver piece, and there would be no comparison in what you could get for them. It also has to do with so many kinds and availability of silver you have sheets and wire and I'll get different thicknesses and shapes—square, round, half-round, flat. It's a head start on all of the shapes you trying to accomplish. I work with an anvil on a stump--standard jewelry studio stuff. I do a lot of work on that. I have different anvils too. One is actually a part of a railroad my dad had, and what's cool about that is if you hammer a piece of metal on it gets a sandy texture. Where are you selling other than Commonwheel? Arati gallery, Green Horse Gallery. I was in Santa Fe for twenty-odd years. 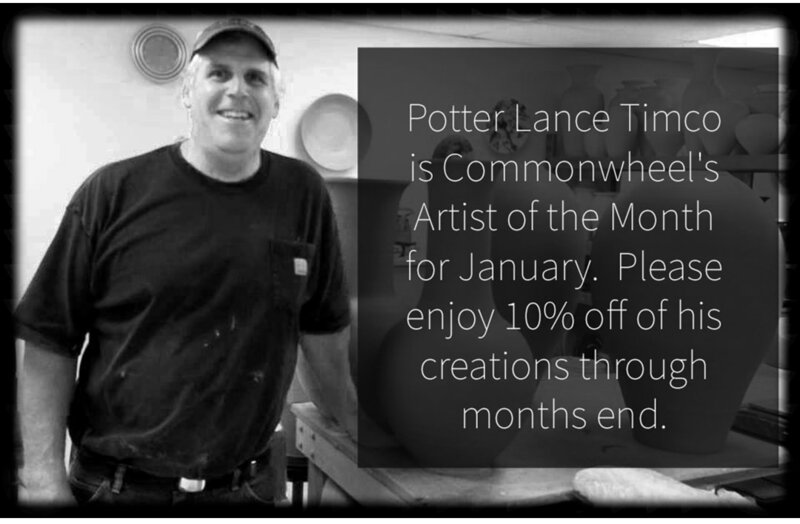 Lance Timco is our January Artist of the Month! Lance writes, I was first attracted to ceramics because of the joy I saw in the making. I delighted in the knowledge gained from the past through the discovery of vessels or shards. I enjoy problem solving and seeking answers to complex questions of which the creation of ceramic objects lends itself. I begin my creative process with the rhythmic wedging of stoneware clay as I contemplate the series of forms to come. Through a blend of concentration and relaxation I find harmony in the forming, decorating and the finishing of each piece. My wheel thrown forms are carved, dried, bisque fired, glazed and finally glaze fired in a Raku kiln or high-fire kiln. 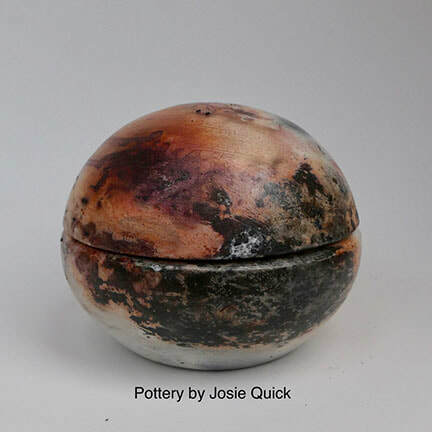 In the process of creating my decorative vessels, I seek traditional form upon which I may draw a line or create line with a variety of methods. 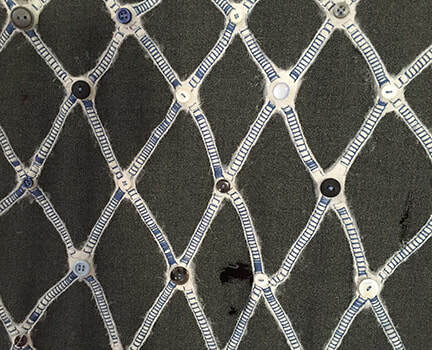 The intention is to provoke a tactile and visual intimacy and allow for contemplation. The concepts start with my heart and are created with my hands; passing to the viewer, this concept hopefully passes from their hands to their heart. I have been an artist potter for over 40 years now. My primary means of forming is throwing on the potter’s wheel. I received my BFA in Ceramics at Stephen F. Austin State University in Nacogdoches, Texas under Piero Fenci and my MA and MFA in ceramics at the University of Dallas under Dan Hammett. My first semester in clay was in the Spring of 1978 which was primarily hand building. In the summer, I became friends with the graduate students and they taught me the basics of throwing on a wheel. When the Fall class started, my instructor asked if anyone wanted to learn to throw. He asked if I wanted to try and I said sure. I hopped on the wheel and proceeded to throw a cylinder to his astonishment. I then told him about learning from the graduate students. Both of my ceramics instructors were graduates of Alfred University in New York under Val Cushing and not only taught me a love of the material but also much of the more technical aspects of clay, glaze and firing. They also inspired me to continue my knowledge of ceramics through collaboration, workshops, reading and of course now, the internet. After graduate school, I moved to Carlsbad, California and opened a studio gallery and worked part time for a production potter. I moved on to Seattle, Washington and taught classes at Seattle Central Community College and Seward Park Arts Studio. The art fair scene was quite strong in Washington state and I participated and many art fairs. After 10 years in Seattle, I decided to move back to Texas and made a stopover in Colorado Springs, but never left. I found Down to Earth Pottery and worked for them as a production potter for a year or so. Art fairs at the time were quite strong in Colorado, Texas, and New Mexico and I attended many an art fair for a number of years. I applied to become a member of Commonwheel Artists Coop in 2006. 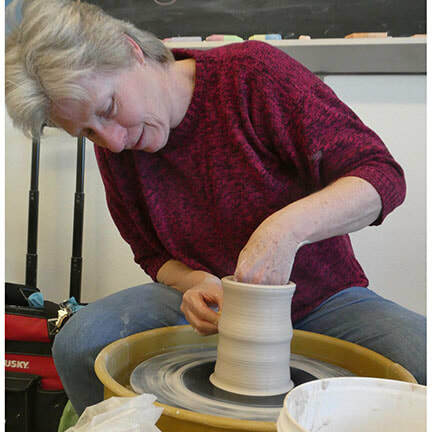 In 2007 I became a ceramics instructor at Pikes Peak Community College and after quickly growing the department, I was offered a permanent position as a faculty member and the head of the department, a position I still hold to this day. In 2009 I set up a studio at Cottonwood Center for the Arts and remain there to this day. Occasionally, I offer private lessons in my studio to beginning and advanced students. Aside from the art fairs, I began marketing my ceramic objects online in 1995. A few years ago, I quit the art fairs entirely and focused on online sales. I sell through Etsy, Handmade at Amazon, and through the Artful Home. A number of other sales come from my studio, social media and networking. We had 27 artists submit almost 100 items for the jury for this show and accepted 60 works from 21 artists. All these artists were asked to tell us a little about themselves and their work. I am 19 and a senior at the University of Northern Colorado, and I’m studying Graphic Design. I’m graduating this December and I’m so excited about it! I’ve been an artist for as long as I can remember. I really enjoyed writing fictional stories when I was 5 or 6 years old, and I liked to illustrate my made-up stories with detailed drawings of my characters. From there stemmed my interest in drawing, and after placing 2nd in an art contest when I was in 2nd grade, I knew this was something I was passionate about. Up until the age of 16, my main media I worked in was pencil; I enjoy drawing photorealistic drawings of people and occasionally landscape sceneries. For my 16th birthday, I received a camera as a birthday present, and that opened a door to a whole new world. Photography very rapidly became my primary media. 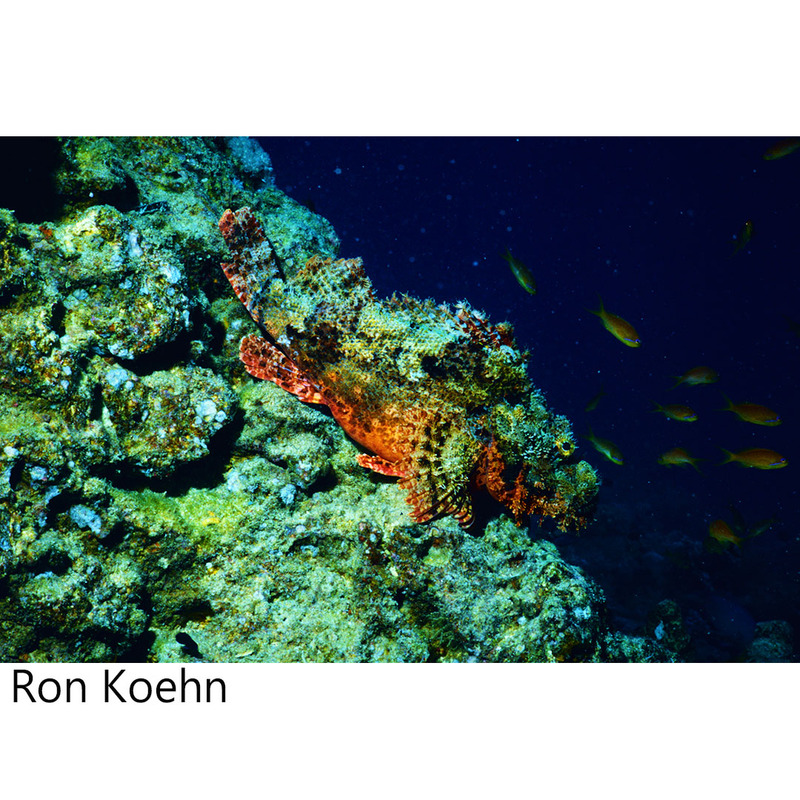 I love photographing nature, from landscapes to close-ups of flowers to shots of wild animals. To this day, photography is still my favorite and best-developed media to work in; however, since coming to college, I have discovered I really enjoy acrylic painting as well, and also like to paint sceneries and objects. 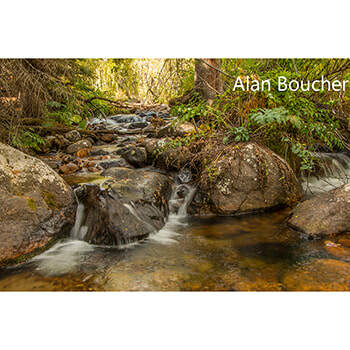 My photographs often reflect my love for the outdoors; I love hiking, camping, kayaking, anything out in the mountains. I have to time the weather, lighting, and location right in order to catch a good photograph, but it is well worth the tedious efforts. Autumn and winter have proven to be the most opportune times for me to photograph; the colors of the trees in the autumn, the snow, and the frequently cloudy skies create the perfect photo environment. 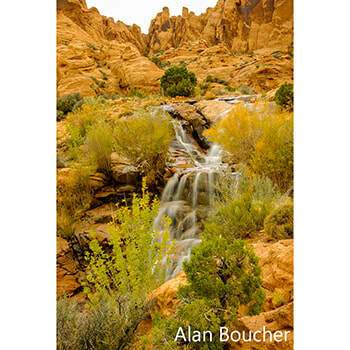 The particular piece being featured in the “Autumn Glory” exhibit is a photo I took in October a few years ago. I was driving back through Independence Pass from a trip to the mountains for a couple days, which consisted of mostly photography opportunities for me. I saw this specific spot in the distance and immediately had to stop; the pop of the yellow aspen trees amongst the dark pine trees was captivating to me. Additionally, a storm was starting to form above the mountains, and the clouds were creating the perfect lighting. 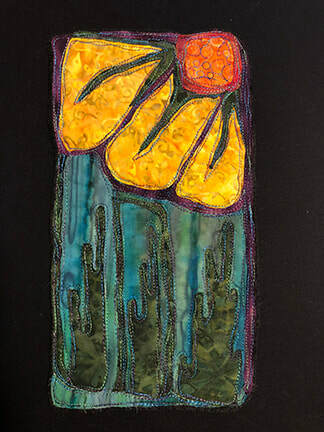 Yellow is one of my favorite colors, so this piece is a favorite of mine because of the splash of bright yellow among the earth tones. Like many people, I had to wait until I retired to begin exploring my artistic abilities. Luckily, I was able to retire early, and after experimenting with many media, including clay, mixed media, alcohol ink, jewelry, etc., I found my true passion in fused glass. I enjoy experimenting, and particularly enjoy creating 3-D pieces in the kiln. This requires a number of firings at varying temperatures, all taking between 9-20 hours, with 4 or 5 hours of cool-down time. 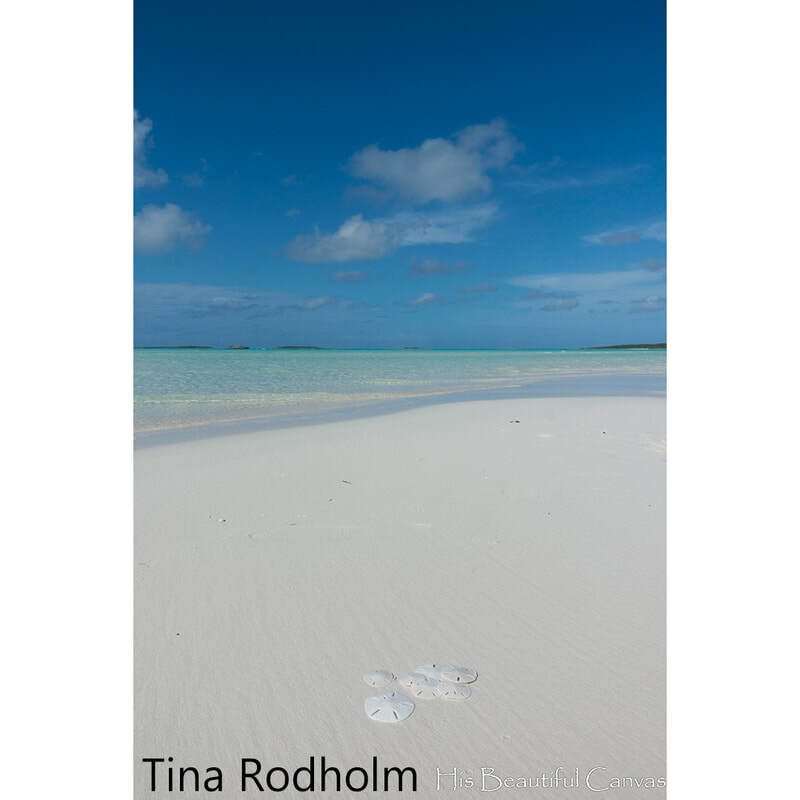 My inspiration comes from nature, including both the mountains and the sea, having lived near the beach in Florida for 12 years. 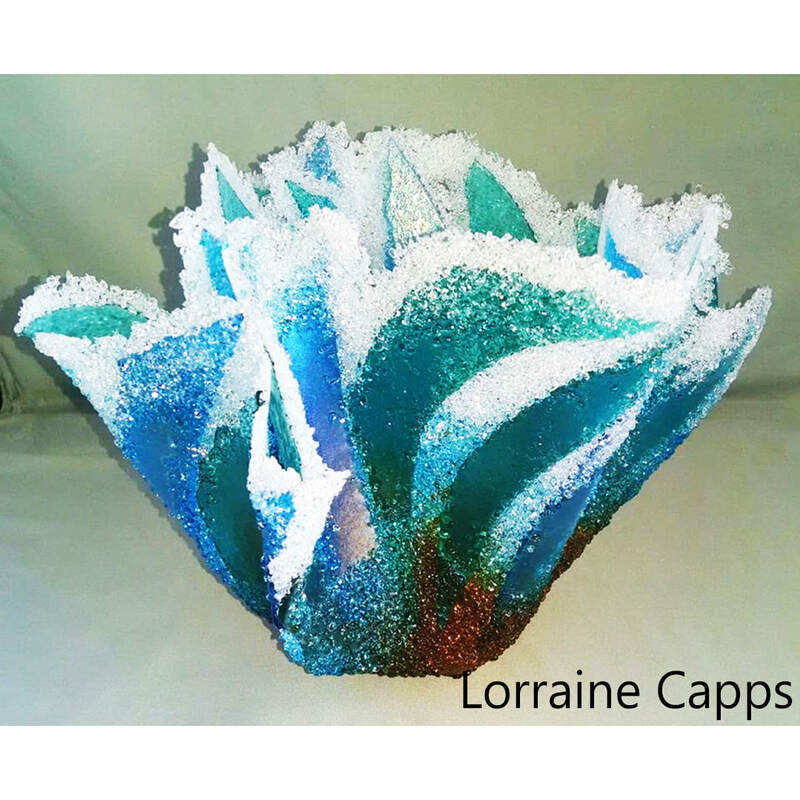 I have been working in fused glass for 14 years. 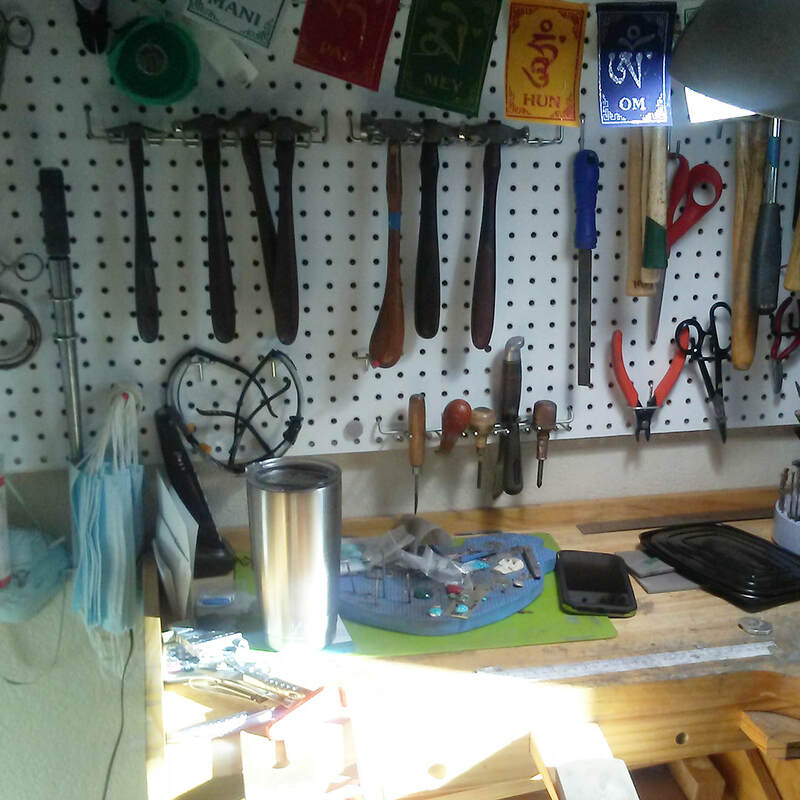 I have three kilns and have taken over every inch of available space in my house and garage for my studio! I’m looking forward to adding a fourth, larger kiln to my collection so that I can create taller and larger pieces. 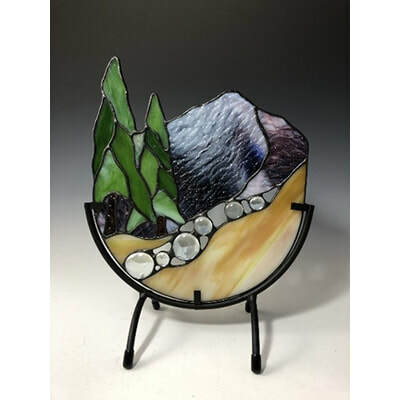 In order to create a fused glass piece, you must start by designing the piece flat, and you must fuse it at a high temperature, between 1400 and 1480 degrees, depending on the effect you are hoping to achieve. If the first firing is successful and does not need additional work and another firing, the piece is cleaned, and dried. Many times there is cold working that must be done after the first firing, which smooths out sharp edges and points. Another firing, called a fire polish, is often necessary to remove any cold working marks left on the glass. The piece can then either be slumped into a bowl form or draped over a mold to make a vertical, 3D piece, as with Glimmering Aspens, the piece I created for “Autumn Glory“. The temperatures of these other firings are much lower than the original, full fuse. I am only exhibiting one piece in this exhibit, so this is my favorite! This is one of my Aspen Grove series that I designed, and I enjoy making variations on this theme. I have always loved Commonwheel Co-op and have been a customer for many years! It is the quintessential retail art gallery, and I have always wanted to enter one of their exhibits. Additionally, I love the theme as trees in general, and aspens in particular, are my favorite things in nature, and autumn is my favorite season of the year! My work can be found on my Facebook page, LoLo’s Paloozas (www.facebook.com/LoLosPaloozas/), and is currently sold in the Strictly Guffey Gallery in Guffey, Colorado. 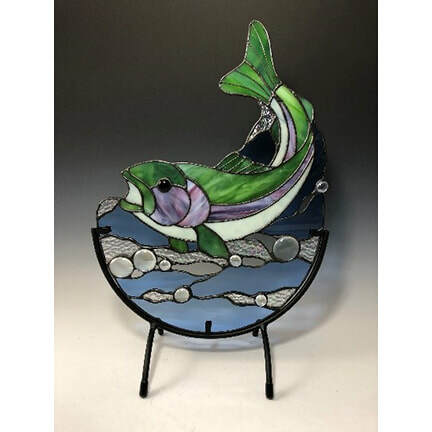 I fell in love with fused glass art about 10 years ago when I saw someone wearing a dichroic pendant and took a class to learn to make my own. I love the beauty of art glass and the infinite combinations and reactions that can be achieved. I love that the melting glass changes form and defines itself. The anticipation of opening the kiln to see the new creations is really exciting. 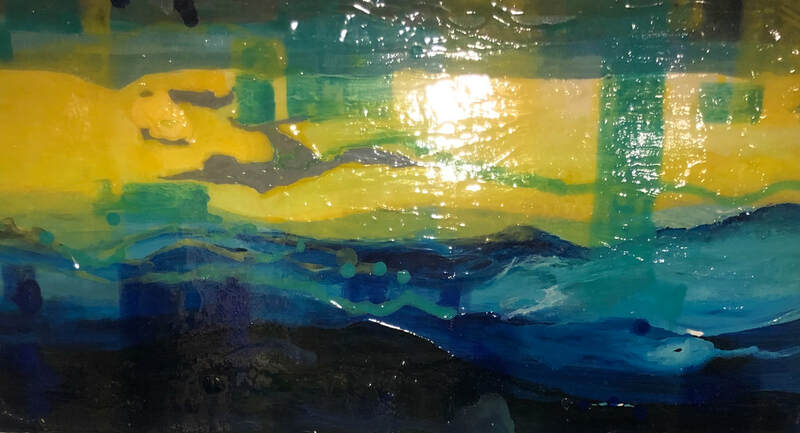 My fused glass landscapes are created over several days in multiple kiln firings by melting layers and pieces of sheet glass between 1200-1500 degrees. 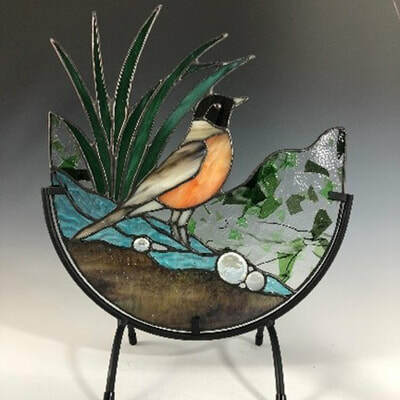 First, the basic layers are built and completely melted to form the base, then, painterly details are added with smaller pieces, grains of glass and glass powders. When all the layers are complete, the glass is cut with a wet saw to make nice edges that allow the light in to the glass. Finally, I paint lithograph style details and fire one last time to polish the cut edges and cure the paint. Glass must be heated and cooled slowly. The entire process takes about a week to complete a picture. My favorite piece accepted in the event is Maple Blaze. 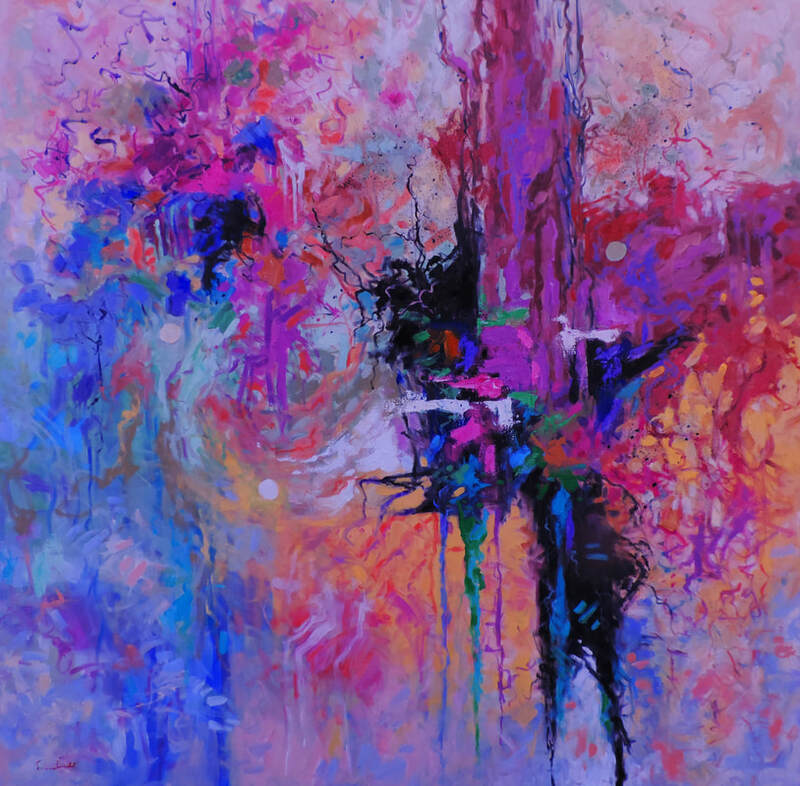 The piece incorporated several experimental processes and turned out stunning with so much depth, complimentary color and interest. It is a very deliberate, happy accident. 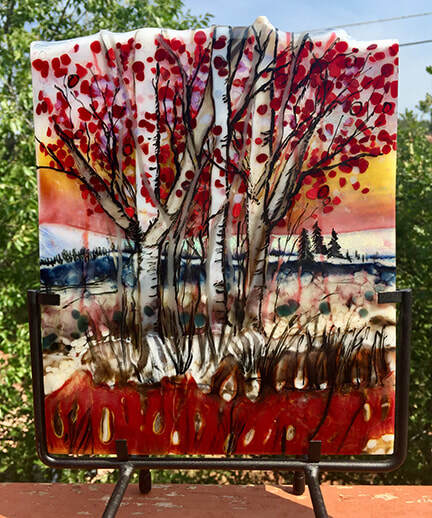 My favorite subjects in glass landscape are trees and Autumn truly is a glorious time with so much inspiration. As an elementary art teacher, my students and their sense of wonder in the world constantly motivate me. 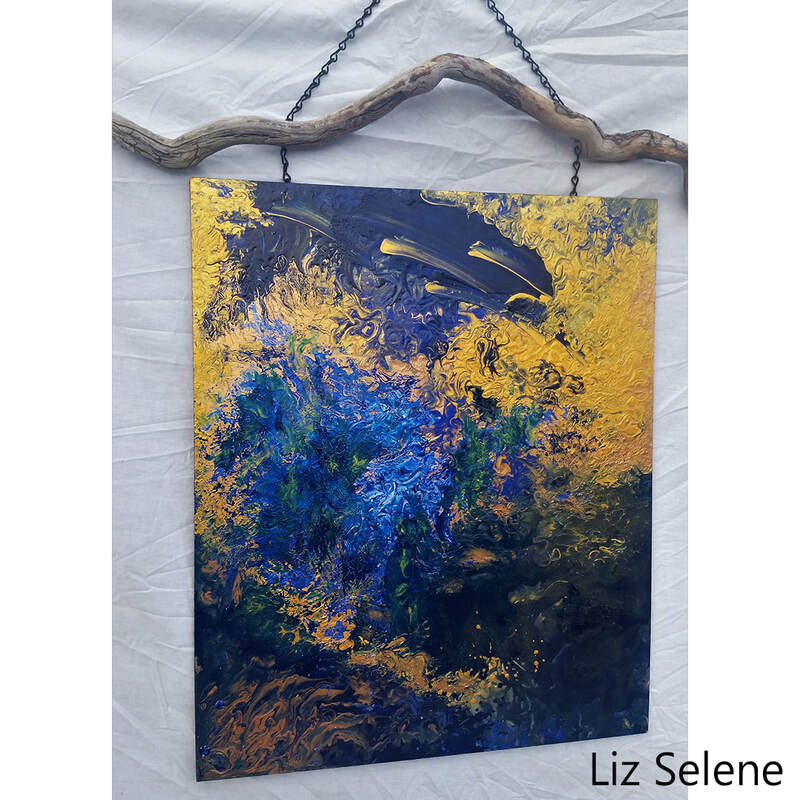 The beauty of our Colorado landscape and wildlife inspire my mixed media paintings and my love of nature as a gardener, skier, mountain biker, and hiker is reflected on my canvas. 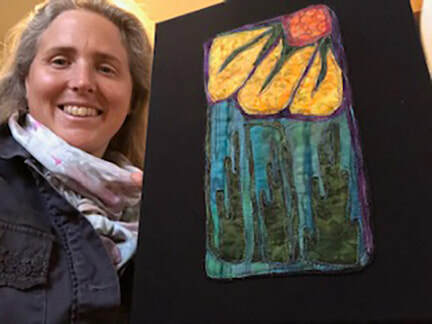 I create whimsical imagery and form in my aspen tree paintings that combine my formal training as a botanical illustrator and collage work using trail maps found on my travels. The assortment of materials I use transport you to my outdoor playground of colorful whimsy and realism and offer a moment of peace to consider our paths. I was given an Olympus OM-10 by my father that I carried in my backpack through the Sierras, Olympics and Cascades long before the luxuries of digital cameras came along. In the 90’s I made my home in the Rockies and attended The Art Institute of Colorado to study Interior Design. I prefer to work in one click, one frame. I see my camera as meditation, an opportunity for peace and stillness. Rather than layering or stacking frames I chooses to step into the stillness offered in the silence created within my camera lens. I try to “work” every day. But calling is work makes me giggle. 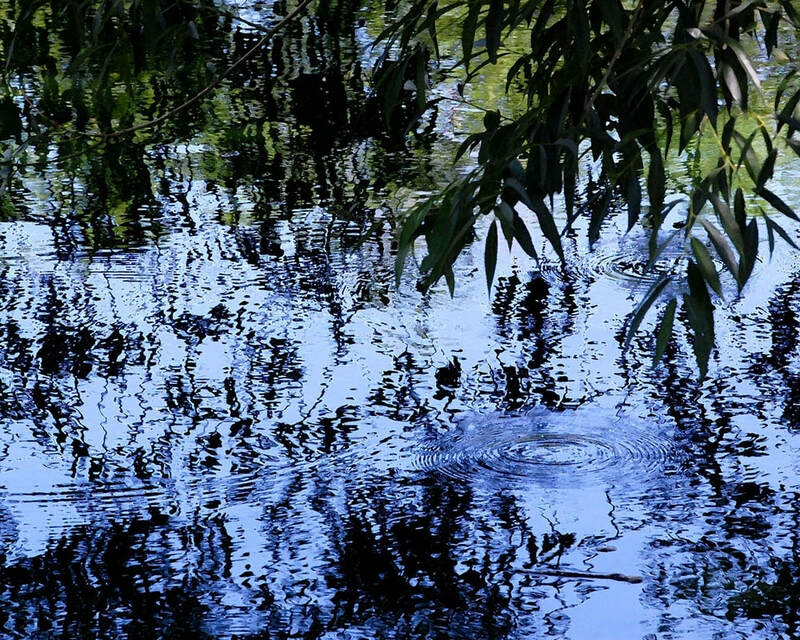 Quite simply, for me, my camera is meditation. Working is spending time with the sky, the birds, and the flowers. It may mean I am on my patio with snowflakes or hummingbirds. If I am lucky it means my husband is my driver and I am wandering our beautiful country with our camping gear looking for a peaceful spot to wake up in. Because my work process involves being in the right place, at the right time—hopefully with the right light. My “work” is helping learn patience. Without it I would have lost focus long ago. The Story (above) is my personal favorite in this show because it is my story, it is the story of all of us. It is why I take the photos I take. It is The Story I attempt to tell with each photo. It is what I wrote when I first opened my site to sell my art - Life is a cycle. We plant seeds then nurture them as they struggle to find the sun and bloom. It is the purpose of all living things to reach into the earth and find the power to bloom again and again. I don’t pose photographs, I capture them. She is, in my mind, the perfect capture of The Story – and she tells it beautifully exactly where she fell. I love Commonwheel. 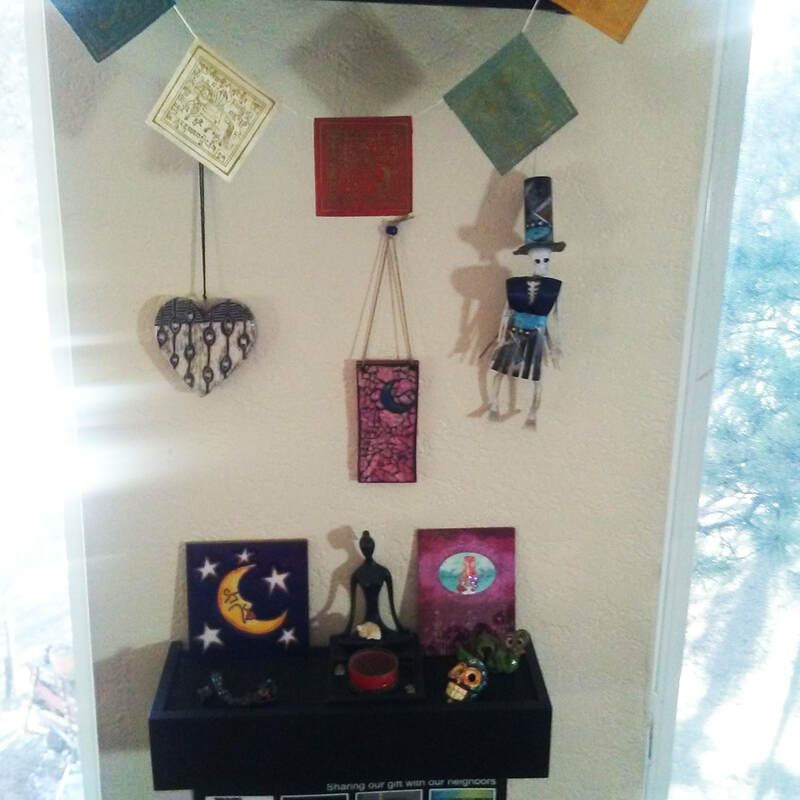 I can’t image many places it would make me happier to see my pieces hang. It really is that simple. What is art? To me, art is beauty, though beauty is in the eye of the beholder. As a child I enjoyed coloring, cutting out paper dolls and clothes, reading, putting puzzles together (still do). I loved looking at pretty pictures. Maybe I was born with this love of putting things together, of seeing a swan in a lake and painting its likeness to the best of my ability, of making a story come alive in MY eyes, through painting. Or maybe I just inherited it from my Mother who started painting after I left home, or my Father who was a carpenter and loved making beautiful things. Even though I didn’t know it as a child, I’ve always been interested in art. I am a realist artist, oils being my choice of medium. I love the Old Masters and their proven methods of traditional painting skills and I continuously strive to learn and practice these skills. I love plein air painting – portraying the beauty of the landscapes and wildlife as I see it; striving to make the viewer feel the water flowing, see the flowers blowing in the wind, feel the snow falling, feel the energy of the animals romping in the fields or the birds flying. I also love painting in my studio using my own photos as reference material. The painting, Elk in the Water, is a combination of my imagination for the background and a photo of the elk. I drew the elk first, making sure I had its features correct. Then, using acrylic paints, I partially painted the elk, so I would not cover up the drawing as I painted the background. As the background is not as detailed as the elk, I didn’t draw it in but just started painting the sky. Then the mountains and background trees. Then came the small island on the right side, water, and left bottom land, painting around the elk. Next came the island trees (trunks only) on the right and bottom left. Leaves then completed the trees. Right now, I am still working on this painting. The elk has to be completed and refined and the elk’s legs need some splashing water around them. Then I will put the painting away for maybe a week or so. At that time, I will decide if I am happy with it, or if it needs more work. As acrylic dries as you use it, I will be able to spray this painting with an acrylic conservation varnish to preserve the painting from dust and light. Then comes a most important decision, the frame. I must use a frame that will enhance the painting, not detract from it. 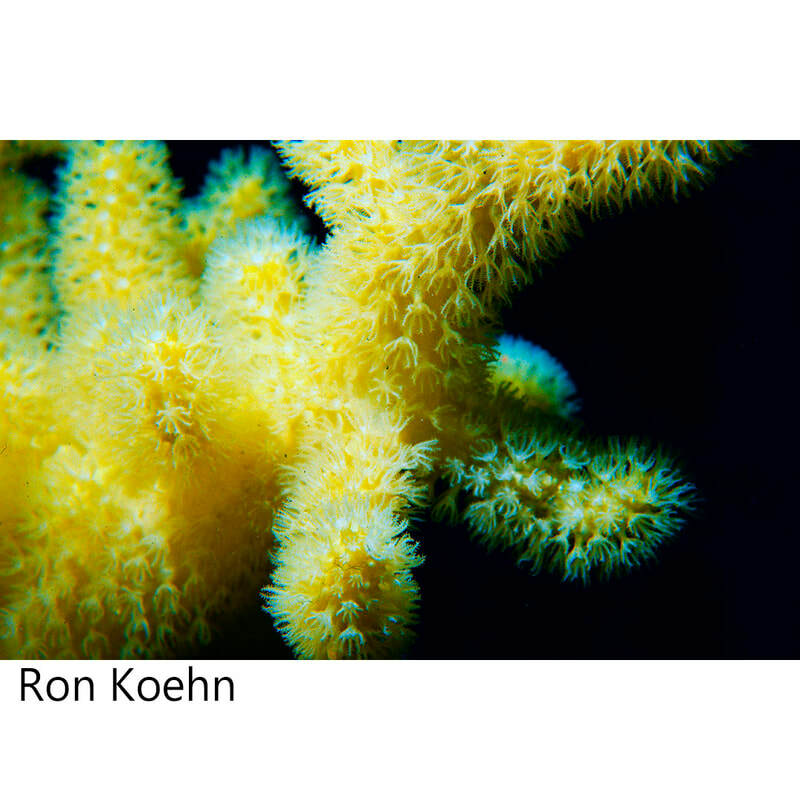 The color must agree with the colors used in the painting. Voila! A new piece of art. My favorite piece for this Autumn Glory Show is, Elk in the Aspens. I used my favorite medium, oils, because it flows easily. I had fun doing it and I think it turned out great. It portrays my love of the beauty of this country, its fauna and its wildlife. I love to show my work and I happened to have on hand a few paintings that fit the theme of this show. Since I was young I've been interested in art, and because my mother is an artist, there were always materials available for making art. 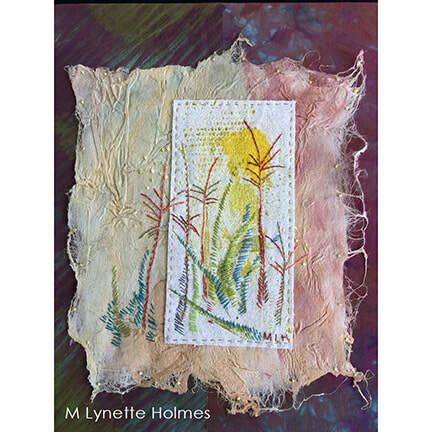 I've drawn, painted, collaged, and sewn since early grade school. 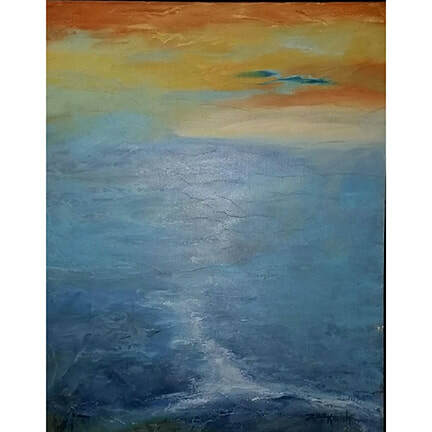 I began oil painting seriously only recently, in January 2016, first taking lessons with Erin Gillespie at Bemis School of Art, then painting with her weekly in my home from April 2017 until present. Oil painting captivates me because it allows for such freedom of expression in both color and stroke. Subject choice is both emotional and intended to challenge me to grow as a painter. In the painting of pumpkins, I was excited to capture a magical day with my kids at the pumpkin patch, as well as to paint the pumpkins and aged wheelbarrow - two subjects I had not painted before. Each painting starts with a sketch, either in graphite or charcoal, followed by a wash of oil paint thinned with mineral spirits. Once the wash is dry, thicker layers of paint are put down, with highlights being added last to make the painting sparkle. While I love the vibrant and voluminous pumpkins, the painting of grain harvest in Afghanistan is my favorite for several reasons. The idea for painting the Afghanistan countryside came when I heard a former military service woman on the radio talk about how meaningful the rural parts of war-torn Middle Eastern countries are to many soldiers since they spend months and years in these areas getting to know the people and landscapes, areas not widely featured in media coverage of the wars. I grew up on a farm in the high desert of Northern California, a rural region with a landscape that is very meaningful to me, so I can relate to a little-known landscape holding such personal import. In addition, my father grew and harvested grain himself, so the light coming through the partially harvested grain evokes especially fond memories, and this particular painting features interesting rock formations not unlike those found in my own home region. I also loved the idea of painting a scene of peace in a region most commonly associated with political turmoil and war. Fall is my favorite season and provides such inspiration in terms of colors and light. I do not yet have a website, but some of my paintings can be found on my personal facebook page, Arin Holecek. 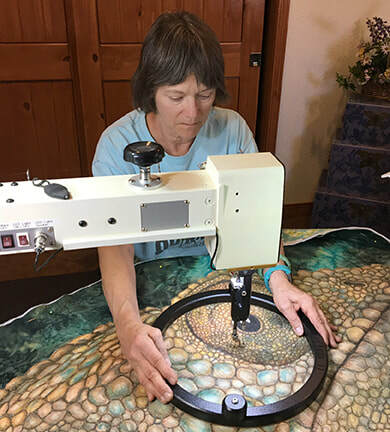 Other works have been displayed at Carnelian Coffee, Ute Pass and Fountain libraries, Cottonwood Center for the Arts, and here at Commonwheel Artists Co-Op. 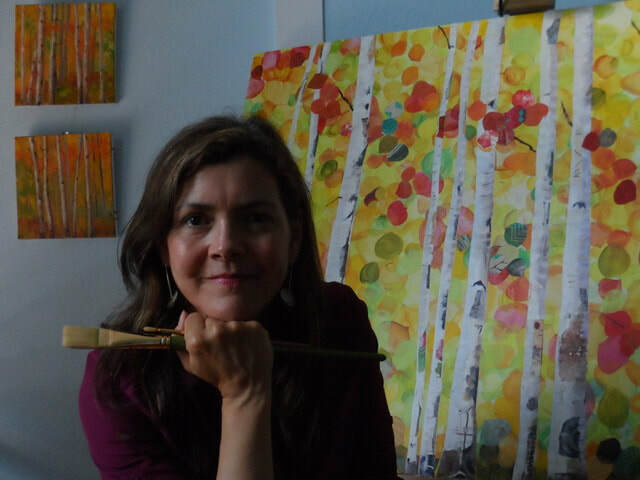 Arin Holocek painting in her studio. I started painting when I was 10 years old. My mother was painting on slate at the time as a hobby and was self-taught. She allowed me to explore with her paint set and I did my first few landscapes on cloth. After producing them, my family saw I had a talent for art. My medium of choice is oil on canvas. I love the rich, smooth texture of oil paints and the ability to blend colors easily. High school and college seemed to fly by, and it was after college when I really started to explore different styles of painting in my free time. I always had an interest in metaphysical and other worldly themes and became highly impressed when I discovered Salvador Dali. Thus, in my twenties, I experimented with the depth of my mind and imagination. It had become tradition for me give away my paintings to friends and family. 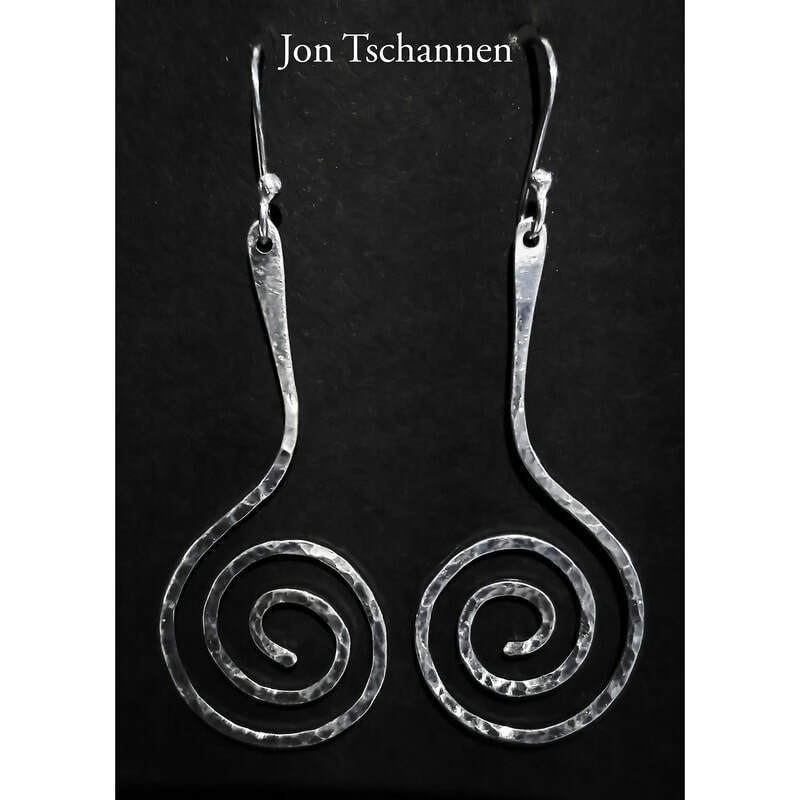 I moved to Tucson, Arizona at the end of 1999 and became involved with the artist community there. 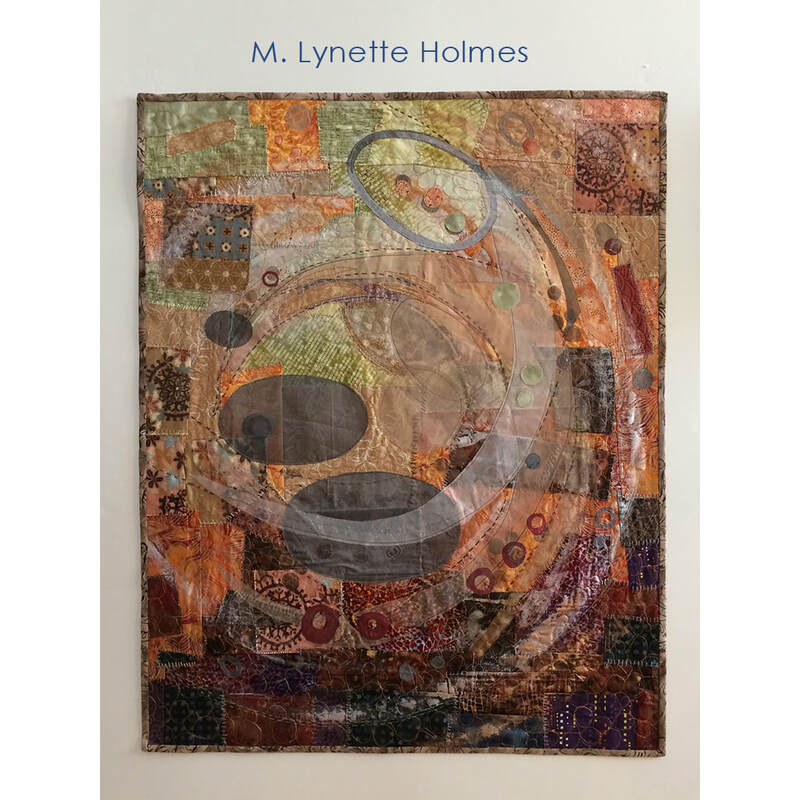 Tucson was home to so many talented artists who represented a variety of mediums; it was there that I felt comfortable experimenting with various styles and themes within my work. For the most part, I still painted for joy and not with the idea I would ever sell my artwork, but eventually I was commissioned a few times and sold pieces in auctions where the proceeds went to charities. As time passed, I really fell in love with painting trees. My style moved away from the psychedelic and more so into painting landscapes and trees. I also found joy in turning photographs into paintings, as to capture elements of emotion and real memories transferred onto canvas. 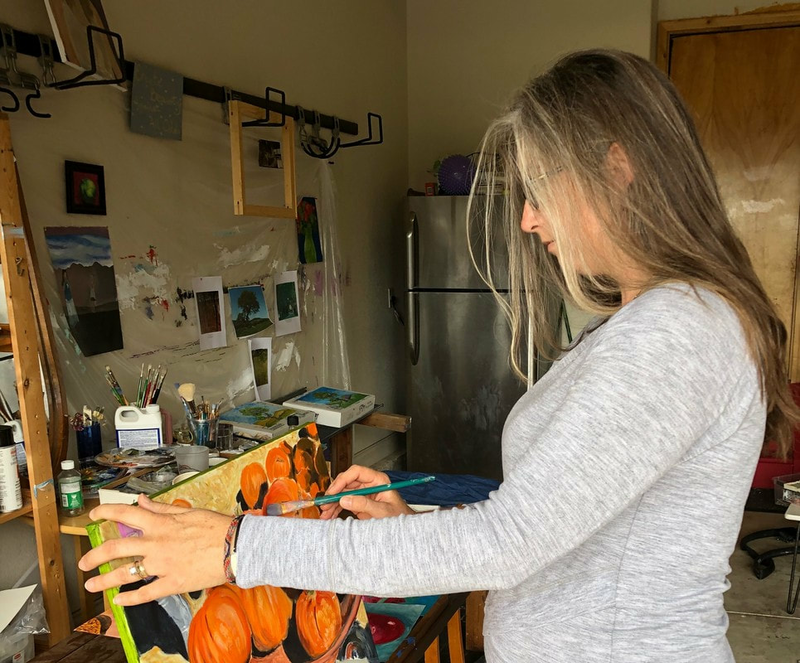 I moved to Colorado Springs in April 2018 and am continuing my journey as an artist. I am excited to share this next chapter of my growth with my new community here in Colorado. It has been an honor to meet some of the local artists here and become involved with the talented artist community in the area. My process with painting involves uncovering the layers of my mind. Painting is an emotional process for me. I find peace in the strokes and each layer speaks to me in way that are hard to put into words. 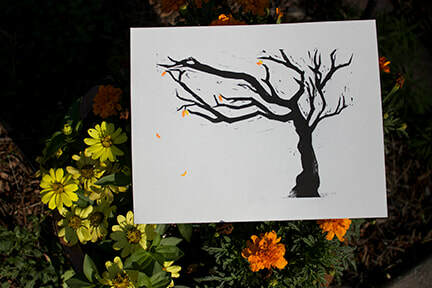 In the case of doing a landscape or a tree, such as Curly Tree, the background goes on first. I find skies to be wondrous and soothing. The background for Curly tree is simple. 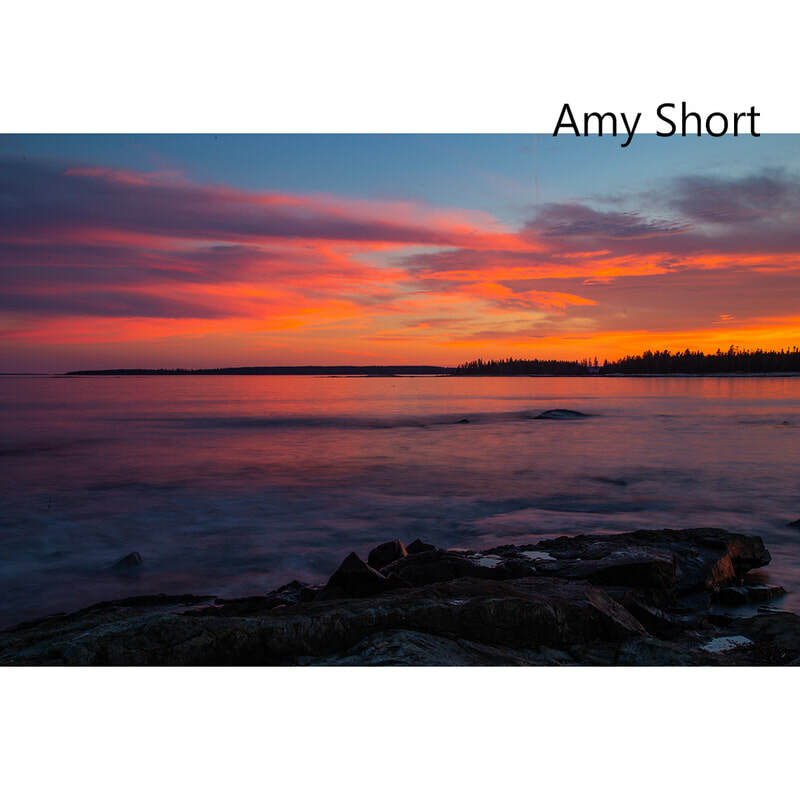 A blend of shades of orange and yellow creates a golden tone often sought out in early dawn or dusk by photographers for its glowing effect. This sky needs no clouds, as the color inspires the autumn feeling of a new season arriving. The floor of the background is done in soft grass for this piece. Once the background is on the canvas, it's all tree from there. I personally love trees. For me, they bare symbolism of rooted growth. Curly tree is strong, it's rooted, and it's fun! The outline of the tree goes on first, with its strong trunk and beautiful curvaceous branches, and then the branches are filled in with several shades of brown for the textured effect of the bark. After the browns are put in, it's time for the finishing touches. Abstract leaves provide the fall colors and little fallen tree branches and fallen leaves provide the final layer for the floor covering. Curly Tree is my favorite accepted piece for this event because it's fun, glowing, and all over the place - like the artist! I was inspired to apply for “Autumn Glory” for a few reasons. One reason is that I love trees. Once I heard about the theme for the show I felt like I'd be right at home creating and submitting my work for a theme I already enjoy. I also love the Autumn season and the colors it boasts. Painting with autumn shades is a pleasure. Additionally, I really like the vibe at Commonwheel and I like the artwork being displayed there, as well as the layout of the store. Manitou Springs is a great place for local talent to showcase their work, and places like Commonwheel, that have character, are a joy to be involved with. Website is at www.Cristina-Manos-Art.com and I have a Facebook page at Cristina Manos Art. I’ve had a love for photographing nature since childhood. While attending church camp in the summer, instead of coming home with pictures of new friends and fun times, the whole role of film would be filled with chipmunks and forested area. The passion has always been there, but it wasn’t until I was an adult that it really developed. There is beauty all around us, and I want to share God’s masterpieces . My artistic process is simple. 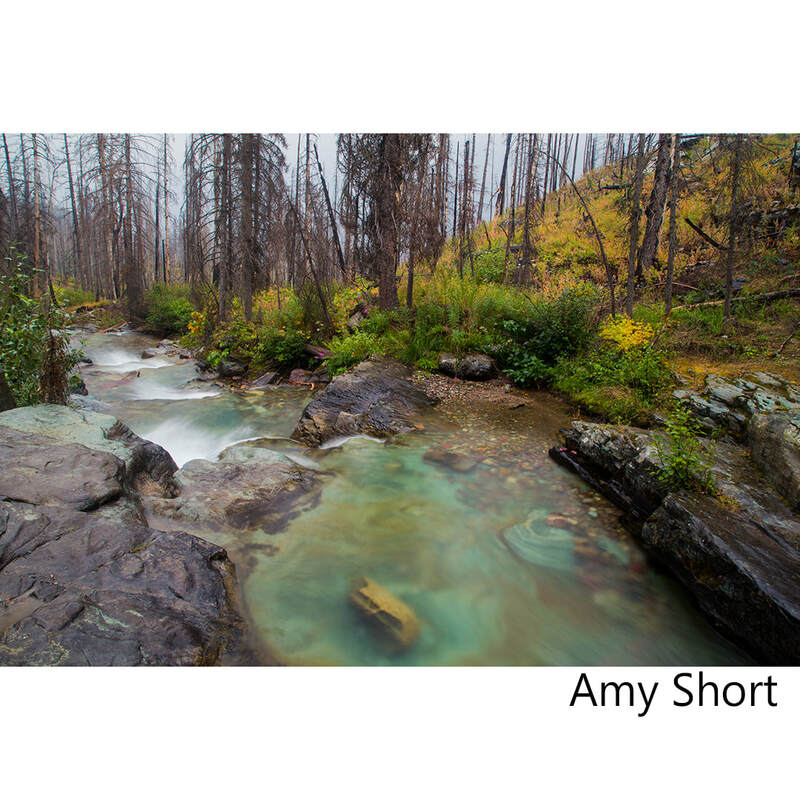 Whether I’m headed to the Colorado mountains or out of state, my camera is always with me. I shoot scenes that speak to my heart and take several shots, bracketing them at various angles. 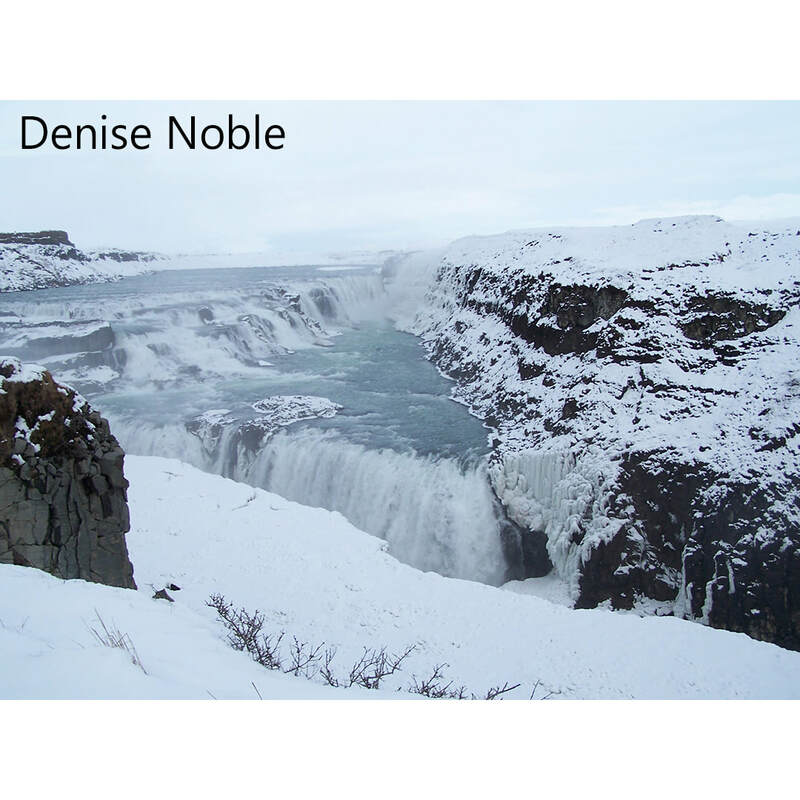 It’s amazing how different a photo can look with a slightly different viewpoint. Additionally, I do my best to capture how the scene truly looks and use very little Photoshop, if any, to modify my pieces. My motto is Have Camera, Will Travel. Easter Frost is my favorite piece accepted for this event. That Easter morning was bitterly cold, and everything had a heavy frost attached. The area was so serene and peaceful. Though my hands were frozen, I wanted to capture this majestic scene for those who wouldn’t see it in person. It was too beautiful not to share. My family and friends are a wonderful support system who continually inspire me. Having said that, I am drawn to photographing trees. Their symbolism of strength, stability and perseverance is always inspirational. I am just beginning to show my work publicly. 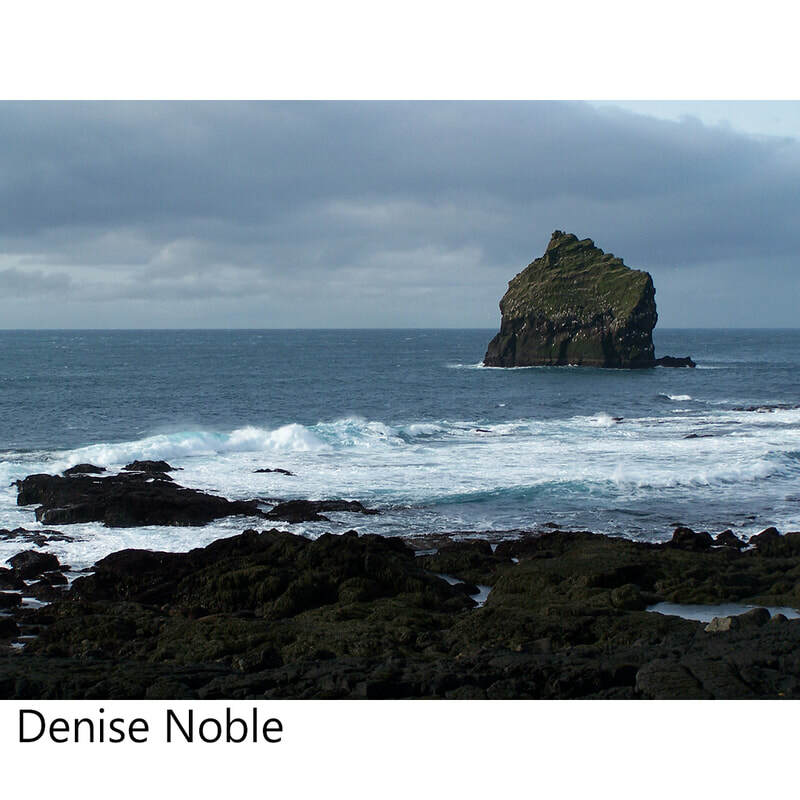 You can find me at A Noble Touch Photography on Facebook. Thank you for attending this show and supporting local artists. I am a runner. About three years ago, my running obsession came to a halt because of health reasons. I needed a new obsession and outlet. My friend and fellow artist, Eric Fetsch, invited me to one of his watercolor workshops. I knew how to draw and sketch but didn’t know how to put color onto my drawings, plus I was intrigued by the magic and beauty of watercolors. I took my first watercolor workshop and was hooked. 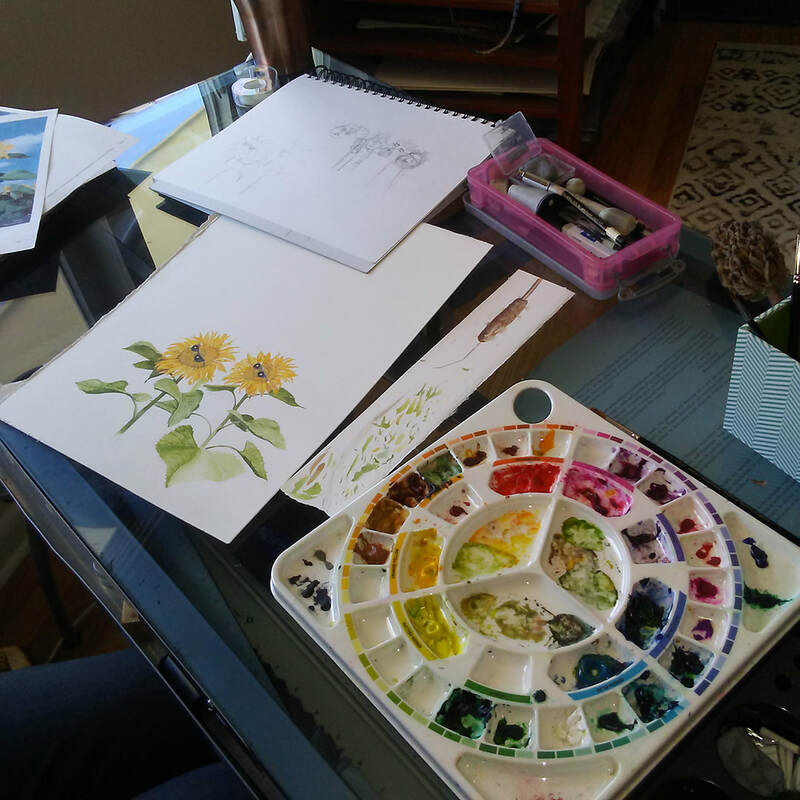 After several more workshops with Eric, I set out to learn as much as I could about the properties of watercolor, color theory, and composition. I was a woman on a mission to become an artist. Painting nearly every day and putting miles on the brush for the last three years has helped me hone my technical skills and artistic ability. I am primarily a self-taught artist who has also done several workshops with fellow artist’s Randy Hale, and Sterling Edwards. I started out painting still life’s and landscapes, transitioned to a more funkified realism style, and now am obsessed with total abstract expressionism. The artists who inspire me are Franz Kline, Mark Rothko, Willem, de Kooning, Kandinsky, and Georgia O’Keefe. I enjoy creating art that leaves lots of room for the viewer’s imagination and interpretation. 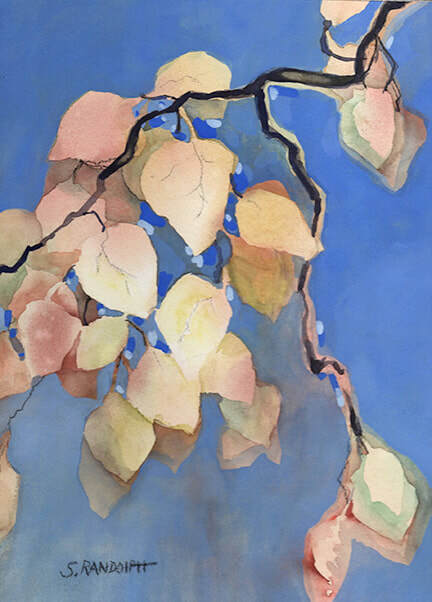 I primarily work in transparent watercolor on paper and acrylic on canvas. I believe art should be fun and my goal is to convey a sense of fun and playfulness in my work. Negative painting is a key element in highly stylized and abstract art. It is incorporated into nearly all of my paintings. It’s fun to paint the space around an object instead of the object itself, then create multiple layers, adding depth to the piece. It’s almost like solving a puzzle. I also use a limited palette of color and ground most of my work in soft neutrals and put pure color near my center of interest. I try to create a variety of soft edges so that your eye can move through the painting and hard edges where I want your eye to linger a bit. My favorite piece for this show is Changes. 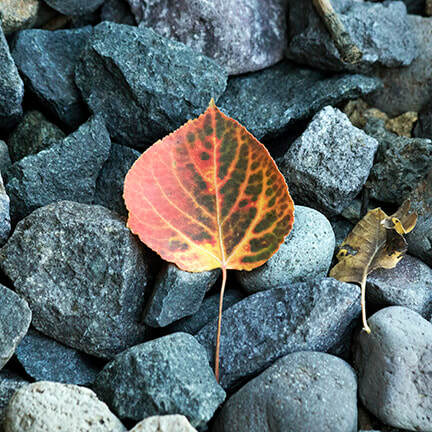 I wanted to show aspen leaves differently. This piece was done on Fabriano Artistico cold pressed watercolor paper with several washes of transparent watercolor. Then, I negatively painted the leaves. To make the transparent watercolors more vibrant, I negatively painted several layers of opaque gouache. Once the piece was dry, I mounted it onto 2” board and finished it with several coats of varnish to protect it. Changes was a fun piece to do and a different way to showcase the beauty of Colorado’s aspen leaves. First, Fall is one of my favorite times of year. 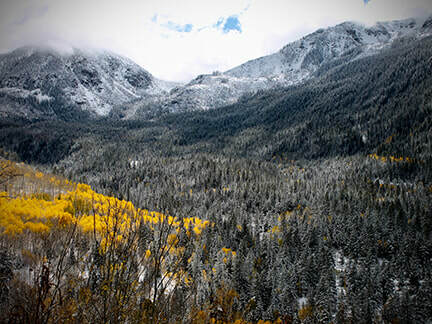 I love the cool crisp air and the change in colors of the landscape, especially in the High Country. I am an emerging artist and would like to share my art and hopefully brighten someone’s day with my artwork. 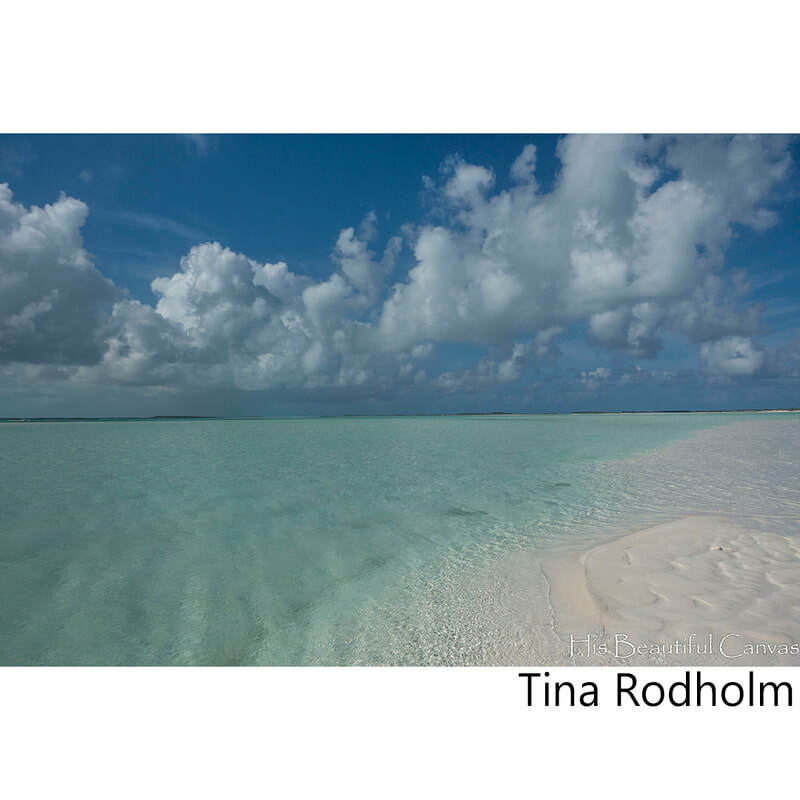 You can find my work at www.susanrandolph.com <http://www.susanrandolph.com/> and Susan Randolph Fine Art on Facebook and Instagram. I am the November guest artist at Boulder Street Gallery on Tejon Street. My work was also accepted into the Parker Art and Music Festival, the Pikes Peak Studio Tour, and The Fine Art and Craft Market in Monument. I’m a major bibliophile. I read books, I teach books, and I write books. I’ve even worked as a mender of books. Loving books first led me to love the process of printing. The reproducible page is such a compelling and rich medium. That said, I love bold and wild art of any medium, and love throwing myself into a new process. Carving a linocut is a quiet but savage procedure. The lines are sketched, and the plan is transferred, but all can change with the twist of a wrist. I love the visible movement of the carving in linocut. My favorite piece for this show? That's a tough choice! The aspen trees were particularly fun. The colors of the aspen in Colorado are so changeable and vibrant. I had a good time mixing the ink for these prints. But, most of all, I love the faint lines of wind in Wind. The tree is a great theme. There is something so appealing about making art of something so fundamental. You can follow me on twitter: @mj_rilling. First of all, I am a pretty old guy that continues on living after already living a full and rewarding life. When I entered into this new domain, I decided to improve on my hobby in photography. I take pictures of things I like, especially if they include natural beauty - (in my opinion). To me, the flat print of my pictures does not represent all the "beauty" of the scene. To overcome this, I have been developing my own technique to restore the feeling of presence to the print. 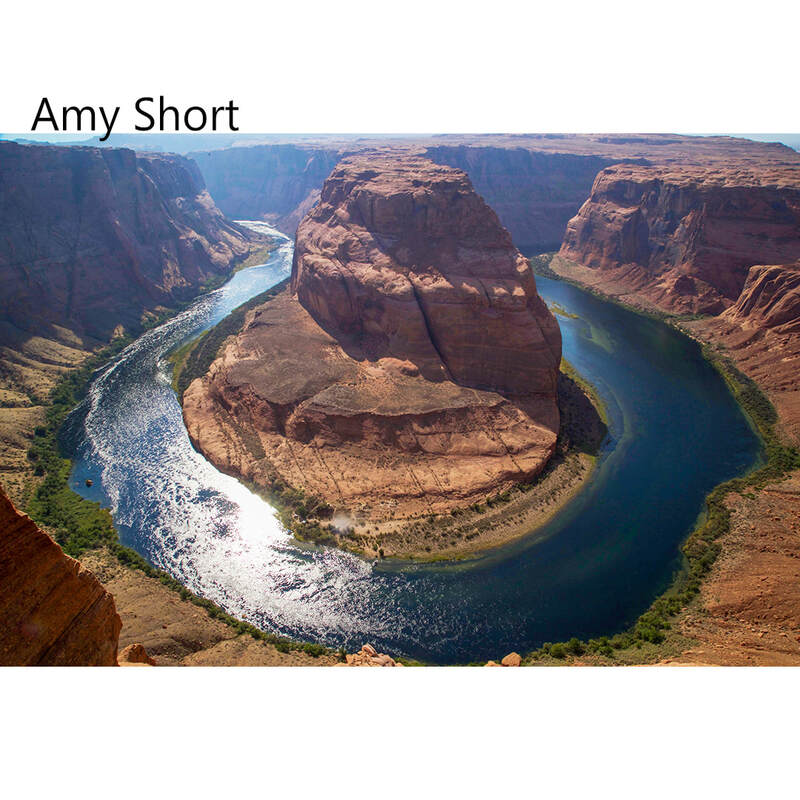 I call it Photo Craft, since it combines two disciplines. This has been my passion now for 4 years and has evolved through many stages. 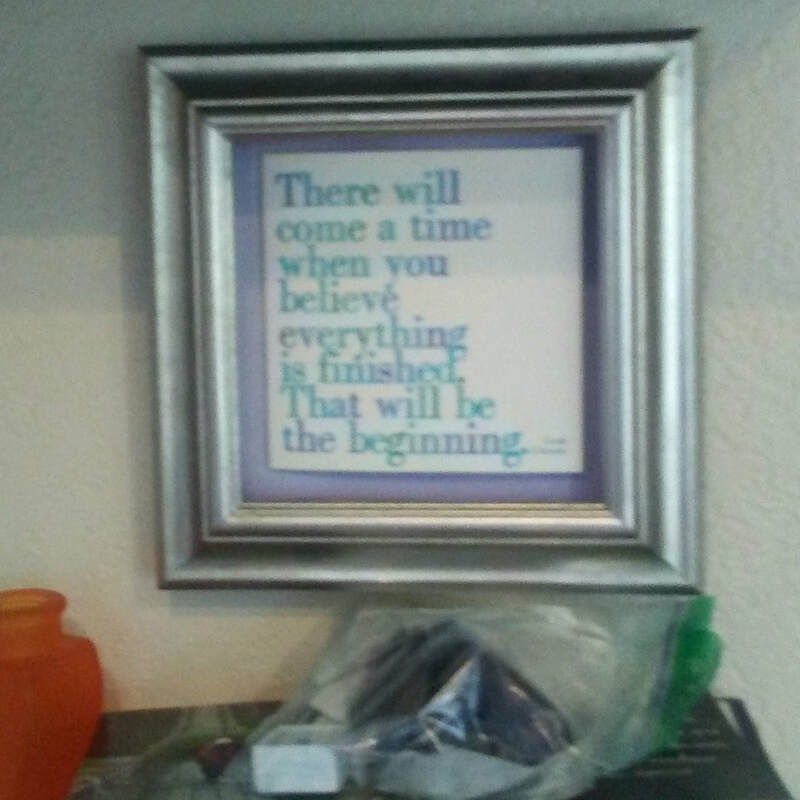 The process today has four basic steps: 1) Take a photograph (or select one from my files), 2) Photoshop process the image into a JPEG file, 3) Print the image, and 4) Add crafting. Framing considerations are kept in mind throughout. 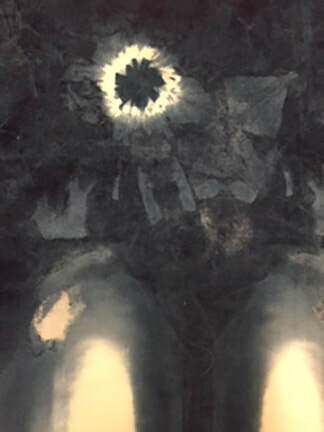 The "craft" part of the process consists of poking, bending, stretching and manipulating the physical print in places that alter the appearance of the photograph. When these distortions to the paper print are made correctly, the picture has a new dimension and is more interesting to view. 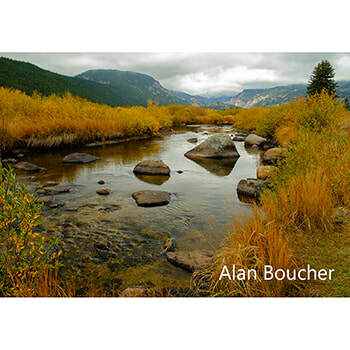 My favorite picture for the Autumn call was the only one that was accepted - Independence Pass Gold. 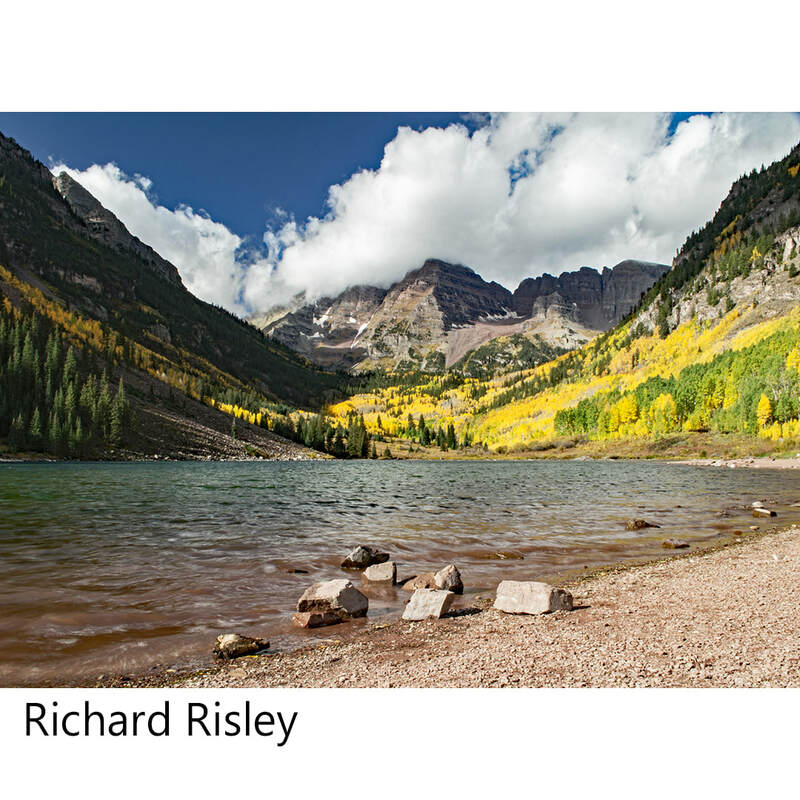 It was taken after a visit to the Maroon Bells, and on the return drive we stopped for this photo-op. At the base of Independence Pass in autumn, you look back to see a wide panorama of hills and mountains with nuggets of golden aspen groves. Lake Creek, which feeds into the Arkansas River, also adds to the view, and the picture lends itself nicely to my craft technique. I was inspired to enter my work because of the opportunity to have it viewed in the art community. I love crafting the photo prints and seeing them come to life. Needless to say, I have a house full of "bent up" pictures now but am doing my best work today. 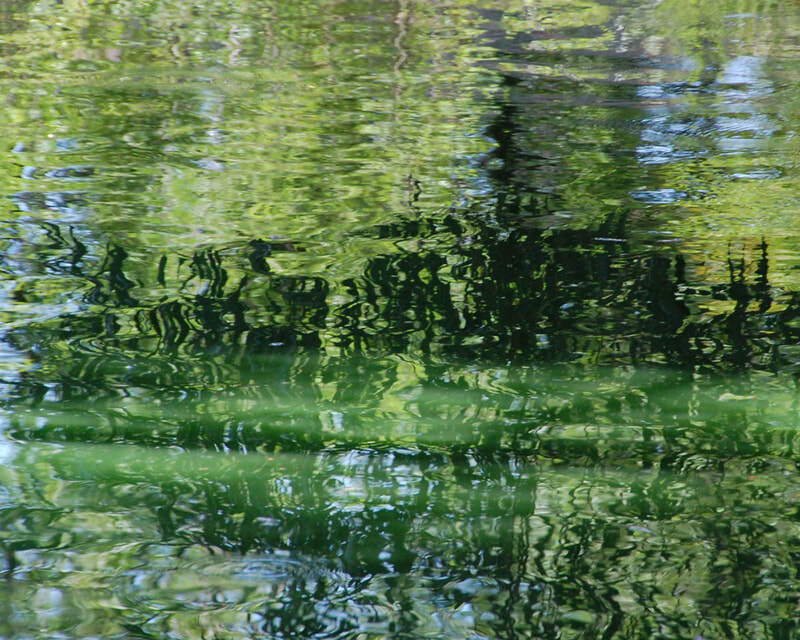 I have photographs on my Fine Art America website: http://richard-risely.pixels.com/ and have a few on ETSY under RichardsPhotoCraft. Of course, the craftwork doesn't show on a computer screen, which is like a flat print. At this time, photos that include my craft work are only available from me. I will be on wall space At Cottonwood Center for the Arts next year in March and May, and at Boulder Street Gallery in April, and hope to more active with Commonwheel. 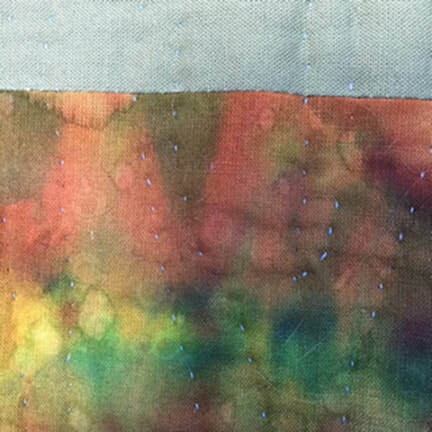 I have been doing batik since I was an art education major in college. But it wasn't in a fibers course. Rather it was a workshop in a non-western art history class. It was only set up for a week, but I was there every chance I could get. Now, I use every space I can get, including my classroom at Patrick Henry Elementary where I'm blessed to have a full-time art teaching job. The need for that space has been especially true ever since my son was born 2 1/2 years ago and my studio became his nursery. But the joy he brings to our world is more inspiring than any other masterpiece I've encountered! Batik is a fairly involved process. I like to summarize for those who want a quick answer that it's "glorified tie-dye". But that's a simplified answer by far. I start with muslin and either brush on or use a tjaunting tool to drip on hot wax to any areas I want to keep white. 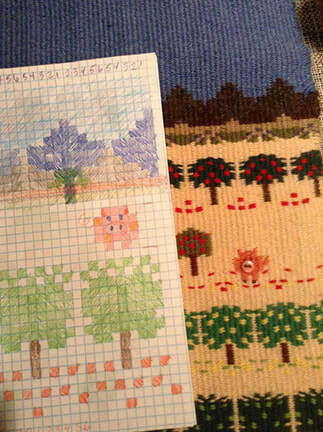 The whole cloth then goes into the lightest color needed for my design, e.g. yellow. Then.... wait: lots of dry time is involved. I usually have many designs going on at once because I can only complete one step in a day. The next day, I isolate the parts I want to keep (yellow) and then choose the next darkest color to dye. 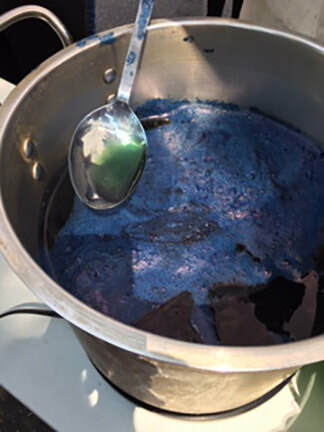 At the end of all the many days of dyeing, the whole cloth is sealed in wax, crumpled, and placed in black or dark brown dye to achieve a crackle effect throughout the piece. That's my favorite part! Then, all the wax is removed (not as fun). But it's so worth it to see my artwork come out from the obscurity of the wax! Every time there's something that happened that wasn't entirely intentional or clear to me during the days and layers of the process. It always stretches me since I'm more naturally an artist who would rather be 100% in control. Even so, batik is my medium of choice without hesitation. Who doesn't love Autumn? And especially in Colorado? I've been inspired since my very first hike out here 10 years ago! Last year I made Path of Reflection as an extension study of my smaller piece, Aspens in Autumn that was done a few years ago. This show was a perfect fit for these pieces. I am elated to have the perfect opportunity to display it with other artists who have been encaptured by this magnificent season! I don't remember when I wasn't interested in creating and looking at art. Both of my parents were creative (my dad with woodworking, my mom with painting) and so it seemed natural to take art all four years of high school and then major in it in college. 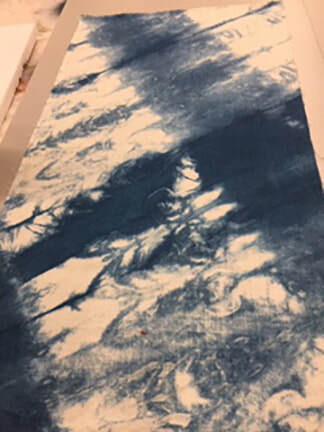 I have worked in just about every medium there is (except glass), but currently I take photos; sometimes I print them on fabric and create a quilted, embellished wall hanging around them. 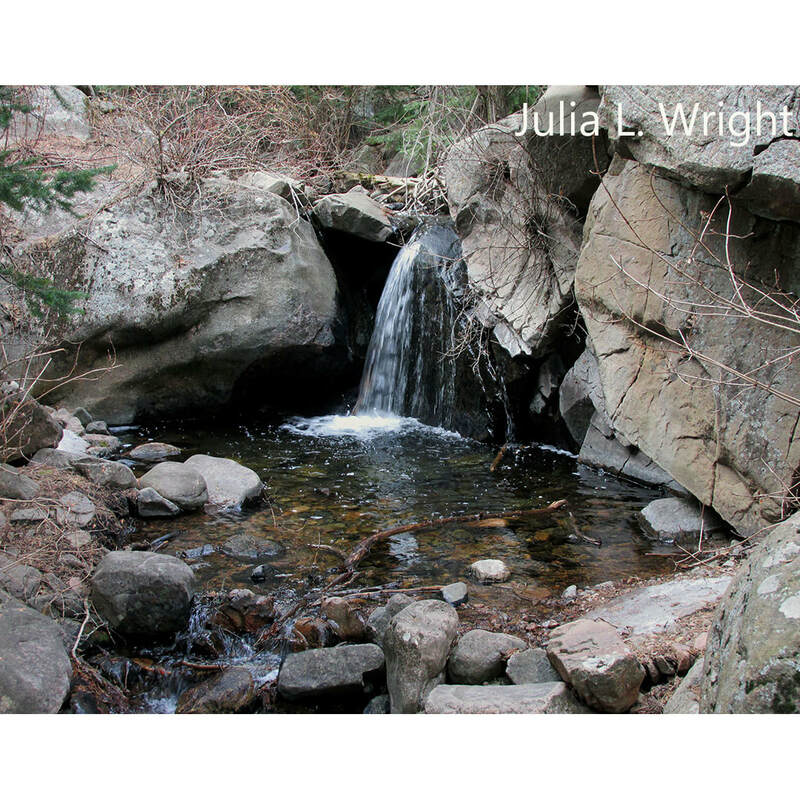 Since I'm very, very busy, photography works well for me - I can socialize with friends and take photos as we hike. Multi-tasking! Basically, my process is to carry a camera nearly everywhere I go. I make sure that I observe as much as possible around me, whether I'm in the mountains, at the seashore or in a city. I look up, look down and look back - there's so much more to life than what is right in front of us. Delicate Dance is the one that was accepted, and I do think it was one of the best I submitted. It illustrates one of the things I most enjoy about being an artist - finding something remarkable that other people might dismiss as ordinary, if they see it at all. Autumn is glorious, and Colorado's autumns are among the best. 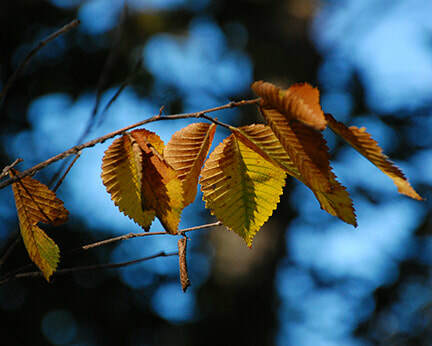 It's as if nature gives us those warm colors to ease us into monochromatic winter. I post photos on my Facebook page (www.facebook.com/rhonda.vanpelt) and this site: rhondashouseofcreativity.shutterfly.com, but I haven't had time to update it lately. 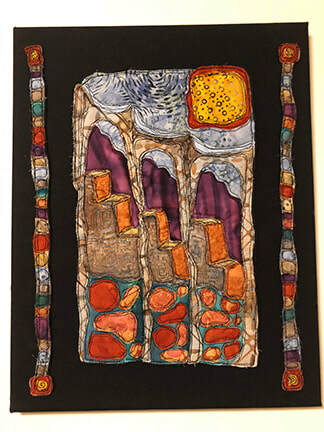 I also show work at Academy Art and Frame and at the Manitou Art Center. 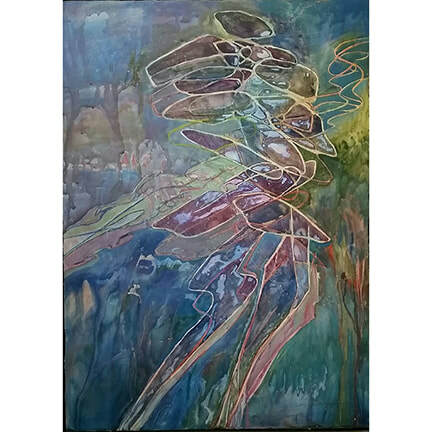 Rhonda Van Pelt, "Delicate Dance"